Conference review: EUROCALL 2009. Sylvia Maciaszczyk, awardee of the 2009 János Kohn Scholarship. Project: Joining the DOTS: A collaborative approach to online teacher training. Ursula Stickler, Pauline Ernest, Tita Beaven, Martina Emke, Aline Germain-Rutherford, Regine Hampel, Joseph Hopkins, Mateusz-Milan Stanojewic. Article: Investigating the inclusion of online discussions to enhance students' learning in general education undergraduate classes. Cindy Gunn. Article: A pronunciation and vocabulary teaching aid for Spanish as a Foreign Language programs at Japanese universities utilizing a Spanish speech recognition system and corpora of academic Spanish. Yasushige Ishikawa, Reiko Tateiwa, Kazuaki Goto, Ichiro Akano. Article: Computer Supported Collaborative LANGUAGE Learning (CSCLL). Min Jung Jee. Article: Computer-assisted Cooperative Learning in EFL in Saudi Arabia. Yousef H. Al-Maini. Book review: Content and Language Integrated Learning: Cultural Diversity. Ed. María Luisa Carrió-Pastor. Review by Ana Sevilla Pavón. 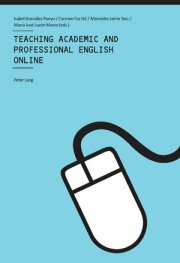 Book review: Teaching Academic and Professional English Online. Eds. Isabel González-Pueyo, Carmen Foz Gil, Mercedes Jaime Siso & María José Luzón Marco. Review by Antonio Martínez Sáez. Report: Report on EUROCALL SIGs 2009-10. Robert O'Dowd. Report: Report on the Virtual Worlds SIG. Graham Davies. The forthcoming issue of ReCALL (Vol. 22, Part 2) will be distributed to EUROCALL members in May 2010. Please send articles, software reviews, details of relevant events or other items of interest for future issues to June Thompson, Editor ReCALL d.j.thompson @ hull.ac.uk. �Inspiring' is the word which best describes my experience of the EUROCALL conference in Gandia. The workshop day was an eye-opener. Personally, I had great difficulty choosing and finally ended up in the excellent workshop about publishing your research in CALL journals. Not only were we told about particular journals' requirements, but we were also shown the dos and don'ts of structuring your own writing in an article format. This �back-to-the basics' approach with the �A+B=C' formula was both easy to understand and very enlightening. Quite naturally, I was most drawn to papers dealing with issues which I am currently also looking at: teachers' experience of ICTs in their work. Therefore, Anna Comas-Quinn's account of how tutors managed blended experiences for Open University students in the U.K. was a very interesting presentation. As more and more tertiary institutions are investing in blended learning solutions, Anna's observations are relevant to many of us indeed. Alex Boulton's presentation on benefits of corpus consultation and Britta Schneider & Ilona Laakkonen's model for integrating corpus into university EAP classrooms inspired me to look at possibilities of how I could include corpus-based learning into the blended course I'm developing. In the three keynote addresses, the important message for me was how technologies can not only add to the educational experience but also, or even more importantly, transform education. Gavin Dudeney's address contained a very inspiring example of a British teacher who helped his students develop high literacy skills by means of a computer game. Steven Thorne talked about how curricula in language education are being, or should be, redefined, so as to include the digital vernaculars our students need in their personal and professional life. Lastly, Francois Mangenot talked about French teacher students cooperating with Japanese learners of French and showed an example of how online exchanges can transform teacher education into a hands-on, learning-by-doing experience. Also, it was hugely inspiring to look at examples of good practice in CALL. In the educational showcase, Liliana Cuesta presented a very interesting model for teacher development courses online. Another interesting tool I saw was the multimedia package for immigrants to Spain by Gemma Delicado, Eva Maria Dominiguez, Enrique Agudo & Maria Antonia Pain. Immigrants to Canada were the target group in Aga Palalas' very interesting research of how mobile devices make learning possible when your students have very little time and energy for regular classes. I suppose there are many ways to understand the theme of the conference: �New Trends in CALL: working together'. For me, the theme captures many issues present in the field. Firstly, it reflects the desire and need of many CALL practitioners to cooperate internationally, which was, in my opinion, reflected in the number of people who came to the first Teacher Education SIG meeting. It seems that many teacher trainers still work independently and would welcome international cooperation in this respect, especially that technologies are changing fast and you do need a support network to stay ahead. I am myself very much looking forward to the SIG's events! Secondly, the conference theme resonated well with pedagogical approaches which were echoed in many papers. By accepting students as equal partners in the educational experience, teachers can make their classes more relevant to their students' needs, as illustrated by Steven Thorne in his Bridging Activities, for example. Thirdly, for those of us who introduce technologies in their institutions, �working together� can be understood as a suggestion that instead of imposing technologies on teachers, we should rather cooperate with them. That latter approach was very well illustrated by John Gillespie talking about how to ensure good staff reaction to ICTs and CALL. For many other reasons, it was great to come to Gandia. Very different from resorts for international tourists, Gandia throbbed with Spanish local life! I had been ignorant about what traditional Spanish dance looks like: very calm and focused, slow, as if the dancers were contemplating the music. If you stayed at the Biarritz you saw the dancing every evening! The Gandia Campus in itself is a very welcoming venue, with a touch of romance in the dark blue-sky full of stars, which were especially picturesque on the first night, when we were greeted by EUROCALL President, Ana María Gimeno Sanz. Did you know that in the Spanish tradition, night is a metaphor for ignorance, and the day is the time of enlightenment? That was a discovery for me when I struggled to understand the inscription on the sky-wall. And yes, the sea! From the very beginning, it was clear that a major issue for many of us would be how to squeeze in a dip in the sea in between the sessions. Congratulations to those who gathered enough energy to manage a dip before breakfast � well done! It was not easy, considering the wonderful evening entertainment. The gala dinner was an event! The live music made many of us struggle not to dance. In the end, some of us surrendered to the passionate guitar and grabbed a person to dance. Those who were far too tired stared with envy. The visit to the Palacio Ducal was equally unforgetful, my colleague tells me, with the contemporary dance show. I wish I hadn't missed it! As a final word, I would like to thank the EUROCALL Executive Committee for granting me the János Kohn Scholarship, which made my attendance at the conference possible. Also, I'd like to thank Margaret Gammell, who never grew tired of my endless queries by e-mail. Finally, I want to add my thanks to the many colleagues I met at EUROCALL 2009, for their encouragement, support, and enthusiasm. Now, I can't wait for EUROCALL 2010! See you there! Developing Online Teaching Skills (DOTS) is one of 20 �Empowering language professionals� projects currently funded by the Council of Europe's European Centre for Modern Languages (ECML). Its principal aim is to develop an online platform for delivering teacher training at a distance. Once completed, this collaborative platform will contain a range of modular activities for self-training via a selection of interactive CMC tools. This paper describes the participative process involved in developing this platform and in creating bite-size introductory activities to online tools for language teaching based on the input of online learning experts and users from 25 European countries. The Council of Europe's European Centre for Modern Languages (ECML) promotes language education in Europe (www.ecml.at). As part of its 2008-2011 programme it is currently supporting 20 projects based on the theme of �Empowering language professionals�. Developing Online Teaching Skills (DOTS) is one of these projects, led by a team of experts from the UK, Germany, Spain, Croatia and Canada. Over four years, DOTS aims to develop a selection of bite-sized online training activities, delivered via an open source virtual platform (Moodle), which can be integrated into teacher training courses or used independently by part-time and full-time teachers. The European Parliament and the Council of Europe recommend eight key competences for all citizens of the knowledge society. These include communication in the mother tongue and in foreign languages; digital and technological competence; learning to learn; and intercultural and social competences (European Commission 2004). Learning languages through the use of online technology allows learners to simultaneously develop key competences in technology, language and learning to learn. Teachers, in particular, can promote learners' continued interest in foreign languages and cultures through the use of up-to-date technology. Teachers, therefore, have a special need to develop and continually enhance these competences. They also need to be equipped with the skills to independently acquire new knowledge and apply this knowledge in their teaching. The Lisbon strategy states explicitly the need to �take steps to ensure that all the teachers involved are qualified in the use of these [new] technologies� (European Commission 2001: �Objective 1�). The DOTS project does not make any assumptions about its users; it does not assume that they are full-time language teachers, or that they are computer literate beyond the most basic skills. Its focus is on the social skills of community building, and the skills needed to teach languages creatively and develop a personal style in an online medium (see Hampel & Stickler 2005). The pedagogical approach of the DOTS project is informed by sociocultural and constructivist theories, both in terms of pedagogy (Arnold & Schüßler 2003) and in terms of technology (Dougiamas 1998). Focusing on the socio-cultural dimensions of learning marks a paradigm shift from past traditions: learning is not considered a �transmission model� in which knowledge is passed from an expert to a novice but rather as an attempt to strike a (temporary) balance between the perceived environment or sensory impressions and the internal, mediated representations (Glasersfeld 2007). Theories of socio-constructivist learning also emphasize the importance of collaborative learning to enable each learner to advance through his/her �zone of proximal development� (Vygotsky 1978: 86), which refers to the difference between the developmental potential a learner can exploit on his/her own and the potential a learner can exploit in collaboration with (more capable) peers. Collaborative learning has been linked to online learning since the inception of computer-mediated communication in the early 1990s (Harasim 1990). Recent years have seen the development of web 2.0 tools (some of which feature in the DOTS project) and an increase in their use in educational settings. Many teachers are using tools such as audio and video conferencing, wikis, blogs, social networking tools and virtual worlds for interaction with and amongst their students and for creating collaborative learning environments. Common ways of implementing collaboration in the classroom include collaborative projects amongst learners in a class � building, for example, a wiki or a website (Engstrom & Jewett 2005) and telecollaborative projects which bring together learners across institutions and across languages (O'Dowd 2006). Collaborative learning has thus come to be part of the new literacies (Richardson 2006) that learners as well as teachers require to engage successfully in today's educational contexts. Critical factors for teachers include fostering learners' collaborative skills, especially at the sociocognitive level; prompting students' critical thinking (Engstrom and Jewett 2005: 14�15); and knowing when and how to intervene (Mangenot & Nissen 2006: 616). Yet teachers often do not possess these skills to support collaborative learning (Mangenot & Nissen 2006), and although training has been shown to be of paramount importance (Hampel 2009), it is still rare to find comprehensive training programmes. DOTS brings together an international group of specialists in teaching languages to adult learners from diverse professional backgrounds. Their pedagogic expertise ensures that the project is focused on best-practice use of ICT, using technology as a means to support the development of communicative and intercultural skills. The Department of Languages at the Open University (OU) in the UK is the co-ordinating institution, and the team members from the OU (Ursula Stickler as project leader and Tita Beaven and Regine Hampel) bring their expertise in synchronous online language teaching and tutor training to the project. Martina Emke is a German freelance language teacher with expertise in non-formal adult education. Pauline Ernest and Joseph Hopkins, from the Language Programme at the Universitat Oberta de Catalunya (UOC), provide their experience in synchronous and asynchronous language learning and teacher training online. Mateusz-Milan Stanojewic from the Faculty of Social Sciences and Humanities at the University of Zagreb brings his expertise in the use of the Moodle platform and his knowledge of the training needs of Eastern European language teachers. A non-European team member, Aline Germain-Rutherford, from the University of Ottawa, who specializes in bilingual education and teacher training, was able to join the project as a result of the collaboration of ECML with the Canadian Educational authorities. Overall, the geographical spread and diversity in learning contexts of the participating institutions (tertiary, adult, continuing education and lifelong learning) guarantee that a variety of perspectives is always taken into account when planning and developing training activities. The aims of the project were divided into a number of objectives, which included the following: identification of the training needs of online language teachers; development of training materials and guidelines for their production; piloting, evaluation and dissemination of the training activities. So far, these objectives have been realized through team communication, involving participants in face to face project workshops, online activities and dissemination. In the first year of the project the online Moodle platform set up by ECML was populated and used by the project team for internal communication. Moodle was chosen as the website platform for three reasons: Firstly, it is based on constructivist principles and therefore lends itself to learner-focused approaches which facilitate collaborative work. Secondly, the software is open source and very stable. Finally, both the University of Zagreb and the Open University UK have chosen Moodle as their VLE platform, which means that project partners already have experience with this particular platform. The workspace is ideal for storing and up-dating documents, saving meeting notes (wiki), holding asynchronous discussions, and for external communication and dissemination of information for the project's workshops (see below). Using an online workspace makes a difference to the nature of teamwork not only by reducing the number of email exchanges, but also by ensuring that all team members have an equal chance of being involved and of working collaboratively in the project, regardless of timetables and timezones. In addition to the Moodle workspace, the project team communicates regularly via the FlashMeeting videoconferencing tool. This first DOTS workshop was held in Graz, Austria, on 4-6 December 2008 and was attended by 26 participants from 25 different European countries. Initial training activities designed by the project team were trialled at the workshop and, based on the feedback received on these and on the results of the needs analysis questionnaire filled in by all participants, the team has since developed 10 bite-size introductory activities to online tools for language teaching. In 2009, these training activities were published via the ECML project website (http://dots.ecml.at/). Detailed results from the needs analysis questionnaire will be published in a special edition of the The Journal of Teaching English with Technology (TEwT) (http://www.iatefl.org.pl/call/callnl.htm) to be published by the IATEFL Poland Computer Special Interest Group in July 2010. This edition will be edited by the DOTS team and will focus on the development of online teaching skills for language teachers. inclusion of activities based on learner reflection. It was also agreed that for most efficient use, the target activities should be modular and searchable both by the communication technology used (e.g. chats, forums, blogs) and by pedagogical elements (e.g. listening comprehension tasks, writing tasks, speaking tasks ). An initial sample of the activities developed at the workshop can be found on the ECML website (http://dots.ecml.at/Resources/tabid/1390/language/en-GB/Default.aspx). 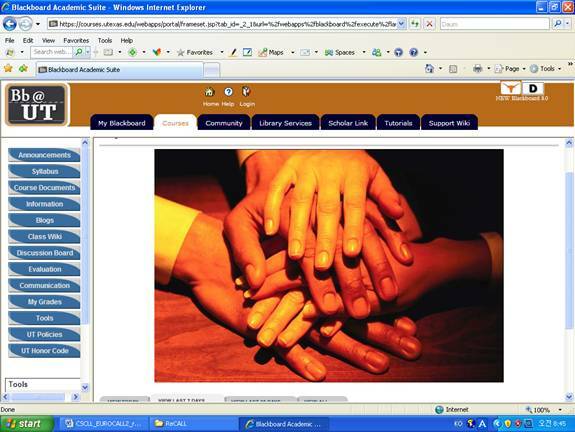 At the beginning of the second year of the project, the Moodle workspace was being used quite frequently by participants and team members to discuss general developments and ways in which the new skills acquired at the 2008 workshop were being implemented and also to disseminate the results of the Needs Analysis Questionnaire. Interaction in the workspace declined, however, during the period following December 2008. After the initial enthusiasm resulting from uploading materials and contributing to the forum, the most popular activities used in the workspace were related to �user data� (i.e. editing and reading information about participants), �wiki activities� (reading, editing, contributing to the wiki); and �resource� (uploading and downloading resources from the workspace). Figure 1. Most popular tools/activities. By the end of 2009, only a small number of participants were still using the workspace regularly. The DOTS team has tried, on several occassions, to reinitiate the dialogue and activities in the workspace but with limited success. One reason for this could be the normal attrition after an intensive workshop, although the lack of two-way communication between participants themselves is no doubt also a relevant factor here. 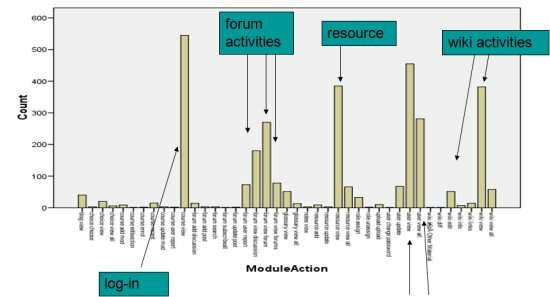 Most forum posts were initiated or answered by team members with communication from participants mainly occurring in a one-way mode (announcements, dissemination of materials). This pattern of communication will need to be taken into account for future development of materials. Contact with some participants from the Graz workshop is ongoing, partly through personal email but also via the joint venture of producing the special edition of The Journal of Teaching English with Technology (TEwT). The DOTS workspace will be made available to the public in 2011. It will contain a range of modular activities for self-training (which will also be available offline) and interactive CMC tools to aid reflection and peer-support. The conclusions and final product of the DOTS project will be presented at an ECML conference in Graz in September 2011. More generally, language teachers will be facing new challenges over the coming years. Younger learners in particular will have increasing expectations regarding the integration of the latest technology in their language learning, while more traditional learners may become wary of the need for yet more technology to �interfere� with their learning. We hope that the DOTS project, with its firm grounding in self-determination and collaborative learning, will help language professionals to make competent, informed choices about the use of appropriate technology in their work and will thus contribute to improving the quality of online language education. Dougiamas, M. (1998) A journey into constructivism. http://dougiamas.com/writing/constructivism.html Last accessed 27/02/2010. Engstrom, M. E. and Jewett, D. (2005) Collaborative learning the wiki way. TechTrends: Linking Research & Practice to Improve Learning, 49 (6): 12�15. European Commission (2001) Concrete future objectives of education systems. http://europa.eu/legislation_summaries/education_training_youth/general_framework/c11049_en.htm Last accessed 27/02/2010. European Commission (2004) Implementation of �Education and Training 2010�. Work Programme. Key competences for lifelong learning. A European Framework. http://ec.europa.eu/education/policies/2010/doc/basicframe.pdf Last accessed 27/02/2010. Hampel, R. (2009) Teaching languages in online environments: Fostering interaction and collaboration. Innovation in Language Learning and Teaching, 3 (1): 35�50. Hampel, R. and Stickler, U. (2005) New skills for new classrooms: training tutors to teach languages online. CALL Journal, 18 (2): 311�326. Harasim, L. (1990) Online education: An environment for collaboration and intellectual amplification. In: Harasim, L. (ed. ), Online education: Perspectives on a new environment. New York: Praeger, 39�64. Lave, J. and Wenger, E. (1991) Situated learning. Legitimate peripheral participation. Cambridge: University of Cambridge Press. Mangenot, F. and Nissen, E. (2006) Collective activity and tutor involvement in e-learning environments for language teachers and learners. CALICO Journal, 23 (3): 601�621. O'Dowd, R. (2006) Telecollaboration and the Development of Intercultural Communicative Competence. Munich: Langenscheidt-Longman. Richardson, W. (2006) Blogs, wikis, podcasts, and other powerful Web tools for classrooms. Thousand Oaks, CA: Corwin Press. von Glasersfeld, E. (2007) Learning as a constructive activity. In: Larochelle, M. (ed. ), Key Works in Radical Constructivism. Rotterdam: Sense Publications, 3-19. Vygotsky, L. S. (1978) Mind in society: The development of higher psychological processes. Cambridge, MA: Harvard University Press. Wenger, E. (1998) Communities of practice. Learning as a social system. http://www.open.ac.uk/ldc08/sites/www.open.ac.uk.ldc08/files/Learningasasocialsystem.pdf Last accessed 27/02/2010. Wenger, E. and Snyder, W. (2000) Communities of practice: The organizational frontier. Harvard Business Review, January-February 2000: 139-145. Wenger, E., McDemott, R. and Snyder, W. (2002) Cultivating communities of practice: A guide to managing knowledge. Cambridge, MA: Harvard Business School Press. Wertsch, J. V. (2007) Mediation. In: Daniels, H., Cole, M. and Wertsch, J. V. (eds. ), The Cambridge companion to Vygotsky. Cambridge: Cambridge University Press, 178-192. Discussion of class material has many educational benefits. In today's modern computerized society, these discussions no longer need to be confined to the classroom setting. This paper discusses students' reactions to the inclusion of online discussions at the undergraduate level. In addition, the author illustrates how the students' comments and concerns have been incorporated over three semesters to improve the assignment for future students. The learning opportunities that classroom discussions provide at all educational levels are numerous. As Yu notes, studies such as the one conducted by Meyer (2006) �support the idea that classroom discussion, when done correctly, is a valuable pedagogical activity� (2009, p. 7). Whether in a large group or in a small group setting, discussion allows the students to learn from each other and helps the teacher to assess the students' understanding of the material being presented to them. Asking for the students' input encourages them to get more involved in the learning process and pushes them toward a more active approach to learning. The success of a classroom discussion, however, depends on a number of factors, for example, how well thought out the discussion topic is, how involved and motivated the students are and whether the discussion is teacher led or student led. The success of a classroom discussion can also be influenced by large classes, a few domineering students who monopolize the conversation and shy students who may be interested and motivated but have difficulty vocalizing their opinions in front of others. At the graduate and undergraduate level, in most universities and colleges, the amount of class time given to each course can have an impact on classroom discussion. Specifically, at the American University of Sharjah in The United Arab Emirates, in a typical graduate or undergraduate class, professors and students meet either once, twice or three times a week for a total of 150 minutes per week, for 15 weeks. It has been my experience that more often than not, classroom discussion must be curtailed in order to cover the course material. In addition to the limited class time, the undergraduate classes usually consist of 30 � 35 students and although some of the students live in the dorms, most of them have long commutes each day to and from university. Some of these problems can be overcome with modern technology. Singh noted in 2003 that�The future of learning is moving toward the notion of blended learning, where two or more delivery mechanisms may be involved in a given learning program. A blended learning program may include computer/web-based self-paced learning modules, live e-learning events, asynchronous discussion forums, and online tests and references� (2003b, p. 127). His prediction is now a reality in many institutions. Blended learning is also known as hybrid courses. Dolan states that �for many faculty members, the move by universities toward greater reliance on online and hybrid courses [blended learning] raises questions of course content and quality� (Dolan, 2008, p. 387). Gillespie acknowledges that, �digital technology has flowed into the mainstream of teaching and learning in Higher Education, although not in an unproblematic way� (2008, p. 121). However, Bender found that �some educators consider the hybrid to be the best of both worlds, as it facilitates the learning process and enhances both student-student and faculty-student communication. It provides the convenience and flexibility of the asynchronous online method of learning, with the real time face-to-face contact� (2003, p. xvi-xvii). Online activities can be synchronous, i.e., all participants are online at the same time and usually receive an instant response, for example in a chat room or virtual classroom, or asynchronous, i.e., responses are delayed, for example, email or discussion boards. Shroff, Vogel & Coombes state that �technology-supported learning environments are considered especially critical to the effectiveness of student learning and performance because these learning environments provide students with more opportunities to interact with instructors and peers than traditional face-to-face learning environments� (2008, p. 112). Bender states that a hybrid class accommodates a variety of learning styles. As she says, �some students might be shy or reluctant to speak in front of a group on campus, yet open up more freely when in front of their computer screen, and the reverse might be true for other students� (2003, p. xvii). Another advantage Bender discusses is that a hybrid class acknowledges and allows for the fact that �different phases of learning can occur in different environments� (xvii). She refers to Kolb's (1984) learning cycle: experience, reflection, conceptualization, and planning, and notes that �the campus class might be the most suitable environment for gaining an experience � and possibly might also be the best place for planning, whereas sandwiched in between, the online class, due to its asynchronous environment, might be the most appropriate forum for reflection and conceptualization� (p. xvii). This is supported by Singh who points out that, �the concept of blended learning is rooted in the idea that learning is not just a one-time event, learning is a continuous process� (Singh, 2003a, p. 53). Gillespie does not dispute the many advantages of technology use in the classroom but questions, �how can we, in a multimedia age, integrate their benefits into teaching and learning?� (2009, p. 121). One way to do this may be through the inclusion of online discussions. An online discussion board, which is �quite flexible and can be used for a variety of purposes� (Israelite and Dunn, 2003, p. 267) is one of many e-tools available to teachers to help their students enhance their learning opportunities outside the walls of the classroom. A discussion board �is primarily text based. It is also asynchronous in nature, meaning that all online participants can log on and participate in discussions at a time convenient to them� (Bender , 2003, p. xvi). McLoughlin and Mynard note that online discussions are student centered with the teacher keeping his/her involvement to a minimum, thus they �can provide a non-intimidating environment where learners feel able to give opinions, offer suggestions and ask questions �and do not have to wait for their turn or for the teacher to invite them to contribute� (2009, p. 148). Some of the disadvantages of online discussions are that they �can be time consuming, are easily open to misinterpretation in the absence of physical cues and are not attractive to those who have limited reading and writing skills� (Williams, 2003, pp. 176 � 177). In addition, Israelite and Dunn caution that, in spite of all the advantages of including online discussions, �It is a mistake to assume that people will be active participants simply because discussion boards are available� (2003, p. 268). Likewise, Chen, Wang and Hung found that, �although online discussions allowed students to interact with each other outside the classroom, many students still chose not to participate� (2009, p. 158). Like classroom discussions, varying participation and student involvement occurs in online discussion as well. What benefits, if any, do students believe they get from the inclusion of online discussions? What drawbacks, if any, do students see with the inclusion of online discussions? What suggestions, if any, do students have to improve the online discussion assignment? The American University of Sharjah (AUS) was founded in 1997. It is a private, coeducational institution with approximately 5,000 students representing over 75 nationalities. The language of instruction is English but for most of the student population, English is their second or third language. Students are not required to buy laptops unless they are majoring in Business. However, AUS has numerous free computer labs for the students in all the buildings and wireless access is provided throughout the campus free of charge. Most of the professors at AUS use the course management system, Ilearn, with their classes. All faculty are given training in how to use Ilearn effectively and ongoing support is available. Thus, the introduction of online discussions into my classes was not hindered by lack of resources. Three undergraduate classes were involved in this research, with a total of 97 students. More information about the classes can be found in Appendix A. AUS currently has a minor in Education but does not have a major in Education, thus, for all but three students who had declared a minor in Education, the participating students in the EDU courses were taking the courses as free electives or to meet a Humanity requirement. The data was collected in three phases, at the end of Spring 2008, the end of Fall 2008 and at the end of Spring 2009. Brock points out that �before we can design e-learning that raises the level of involvement and participation, we first ought to understand the learning situation and perceive the experience from the learner's frame of reference� (Brock, 2003, p. 103). Thus in all three semesters, when the online discussion assignment was introduced at the beginning of the semester I asked the students if they had used online discussions before in any of their classes. These were informal discussions and no formal record was kept of the students' answers but in each class of 32 � 33 students, no more than three or four students said they had used online discussions in their classes. The assignment was then explained, discussion guidelines were given, a demonstration of the discussion board feature of Ilearn was given and the students were told that the assignment was worth 10% of their overall grade. The assignment description available on the syllabus can be found in Appendix B. In your opinion, what were the advantages of the on-line discussions? In your opinion, what were the disadvantages of the on-line discussions? Do you have any suggestions for improving the online discussion assignment? If yes, please list them. After each semester, I read the results of the surveys and made some minor adaptations to the online discussion assignment based on the students' suggestions. Out of the 97 students involved in the study, 85 of them responded to the survey. �They helped us reinforce what we learned during the week. I got to hear other people's opinions that I didn't hear in class.�. Some of the suggestions given in Spring 2008, were incorporated into the assignment starting from Fall 2008. Some of the suggestions from Fall 2008 were then incorporated into the assignment starting from Spring 2009. Some of the suggestions were not incorporated at all. In Spring 2008, the two main suggestions were that we have more free discussions and that I should teach some of the students to be more polite. Both of these suggestions were taken on board. When I was explaining the assignment I also gave a short talk on �netiquette�. This issue did not come up again in the Fall 2008 or Spring 2009 feedback. I had more free discussions and as a result in Fall 2008, I received the suggestion that I should have more directed discussions. We now have what I hope is a happy medium with a mix of directed and free discussion topics. In Fall 2008, several students suggested that I participate in the discussion. Up till now I have not acted on that suggestion. I monitor the discussions and refer to some of the points made, if appropriate, in class, but I believe that by keeping out of the discussion I give the students more freedom to take control over their learning and guide each other instead of getting guidance from me. Another suggestion was to reduce the number of discussion. Instead of being expected to participate in all 10 discussions, some students suggested that they should have the flexibility to participate in five of them while others suggested they should participate in eight of them. Up till now, I have kept the requirement at 10. A suggestion from Spring 2009 that I have incorporated into the assignment is to have discussion leaders each week. At the beginning of the Fall 2009 semester I explained this suggestion to the students and asked them if they would like to try the discussions this way. These new students had nothing to compare to as many of them said they had not used online discussions in any of their classes but were willing to nominate leaders. Another suggestion from Spring 2009 was to keep the small discussion groups but change the groups throughout the semester. I believe that by changing the groups this will not allow for the �build up relationships over time� quote from Williams. Thus, I have decided not to change the groups at this time; however, I may try this suggestion in the future. For the undergraduate students at the American University of Sharjah who participated in this study, the benefits of the online discussion assignment outweighed the drawbacks. Not every student found the assignment to be worthwhile, but many students did and as one student noted, �This was the first course I used online discussions and I found it truly effective and interesting! I would encourage all teachers to use such a technique.� Several students made sound suggestions on how to improve the assignment for future students. As Chen, Wang and Hung note, �the success of an online discussion does not just happen. Its success largely depends on a carefully constructed design plan� (2009, p. 158). As such, I will continue to ask my students for feedback on how to improve the assignment to meet their needs and give them another opportunity to enhance the learning experience for themselves and others. Chen, D., Wang, Y., & Hung, D. (2009) A journey on refining rules for online discussion: Implications for the design of learning management systems. Journal of Interactive Learning Research, 20 (2)157-173. Bender, T. (2003) Discussion- based online teaching to enhance student learning. Virginia: Stylus Publishing. Shroff, R., Vogel, D., & Coombes, J. (2008) Assessing individual-level factors supporting student intrinsic motivation in online discussions: A qualitative study. Journal of Information Systems Education, 19(1): 111 � 126. Dolan, K. (2008) Comparing modes of instruction: The relative efficacy of on-line and in-person teaching for student learning PS, Political Science & Politics, 41(2): 387-391. Gillespie, J. (2008) Mastering Multimedia: Teaching Languages Through Technology. ReCALL, 20(2): 121-123. Gunn, C. (2009) Exploring the use of online discussions in MATESOL classes. In Gunn, C. (ed.) Exploring TESOL practices in the Arabian Gulf. (pp. 141 - 145). Dubai: TESOL Arabia. Israelite L & Dunn N, (2003) Designing asynchronous learning. In Piskurich, G. M. (ed.) The AMA handbook of e-learning: effective design, implementation, and technology solutions (pp. 255-270). New York: AMACOM. Meyer, K. A. (2006) When topics are controversial: Is it better to discuss them face-to-face or online? [Electronic version]. Innovative Higher Education, 31. pp. 175-186. McLoughlin, D. & Mynard, J. (2009) An analysis of higher order thinking in online discussions. Innovations in Education and Teaching International, 46, 2. pp. 147-160. Singh, H. (2003a) Building effective blended learning programs. Educational Technology, 44(1): 5�27. Singh (2003b) Synchronous Collaboration, Live E-learning, and Beyond. In Piskurich, G. M. (ed.) The AMA handbook of e-learning: Effective design, implementation, and technology solutions (pp. 117-130). New York: AMACOM. Williams, S. W. (2003) Discussion groups and chat: Electronic tools for building online communities. In Piskurich, G. M. (ed.) The AMA handbook of e-learning: Effective design, implementation, and technology solutions (pp. 171-182). New York: AMACOM. Yu, S. W. (2009) The impact of online discussion on face-to-face discussion and academic achievement. American Secondary Education, 37(2): 4-25. Introduces students to the basic issues important to the teaching profession. Topics covered include effective teaching practices such as planning, classroom organization, behavior management and use of technology in the classroom. Other issues in teaching including motivation, leadership and multicultural and international education will also be explored. Focuses on the aims and purposes of education and traces the development of education and the concept of schooling from Confucius to contemporary educational thinkers. Gives special attention to issues of current educational concern, including gender matters and values in education. The online discussions will be open each week on Monday after class. There will be four online discussion groups of seven or eight students each. You will stay in the same discussion group for the whole semester. You are free to read and participate in other groups if you wish to. You will have until Sunday at 11 am the following week to participate. To get full credit for each discussion you must have a combined word count of over 100 words. Thus, you may only participate once, but if you do, that participation must be meaningful and reasonably lengthy. For your information, �I totally agree� written 25 times in one week will not count for full participation. This paper reports on a project which researchers at two universities in Japan developed for Spanish as a Foreign Language CALL materials, which has two features, a Spanish speech recognition system based on the AmiVoice Japanese speech recognition system; and a Spanish verb collocation-based vocabulary teaching aid based on a corpus of academic Spanish. The first step was the creation of a Spanish speech recognition system for Japanese university students based on the AmiVoice Japanese pronunciation recognition system developed by Advanced Media Incorporated. The second step was the selection of vocabulary for a specific genre of academic Spanish, which was done in the following way: (1) Articles in a Spanish-language academic journal on Spanish Literature, Culture, History, and Language (themes typically chosen by students for graduation theses) compiled and published annually in Japan were used as the source of data for the compilation of a corpus. (2) All the verbs were extracted from the data. (3) The extracted verbs were compared with a corpus of verbs from graduation theses written in Japanese by Japanese university students and (4) by taking into account their needs for learning verbs, a list of verb-centered collocations was compiled. Finally, we developed a user-friendly Spanish pronunciation and verb collocation-based vocabulary teaching aid. The aid displays the verb collocations on a computer screen during pronunciation training. The training had two phases. The first phase required Japanese university students to carefully and repeatedly listen to model pronunciation examples of the vocabulary items, and to pronounce the vocabulary. This pronunciation training is intended to contribute to effective memorizing of the verb collocations. The next phase required the students to repeat the vocabulary items at the rate of the model utterance as well as to imitate the stress and other intonation features. This training is expected to help Japanese students speak Spanish more fluently. Corpus-based analysis of language use provides us with three perspectives. The first is that words do not occur at random in a text, and that the open-choice principle, in which any word might follow any other as long as accuracy is maintained semantically and grammatically, does not provide for sufficiently substantial restraints on consecutive choices (Sinclair 1991). Sinclair (1991) also argues that a language user has available to him or her a large number of semi pre-constructed phrases that as units constitute single choices, even though they might appear to be analyzable into segments, i.e. the idiom principle. Nattinger and DeCarrio (1992) claim �conventionalized form/function composites' can be included as a type of Sinclair's �semi pre-constructed phrases.' These units of two or more words in pre-constructed phrases, or collocations, occur together in predictable patterns. The second perspective is that preconstructed collocations are evenly distributed in a text, and that a large majority of a text consists of such collocations (Akano 2006). The following text from Akano (2006) illustrates how evenly preconstructed collocations are distributed in a text. The phrases indicated in boldface are all preconstructed collocations. When confronted with failure, most people react with either positive thinking or negative thinking. Positive-minded individuals view failure as a learning experience, a valuable lesson which might lead to success in their next attempt. Such people recover quickly from discouragement and look to the future with hope. On the other hand, people who react to failure with negative thinking tend to view each case of failure as something vital to their whole life. They are easily discouraged and some fall into severe mental depression, making it hard for them to take even a small risk for the next challenge. Since nobody can escape from failure in life, it would be much better to develop a positive attitude toward it, increasing the chances for success. Another survey revealed how evenly collocations are distributed in a text. The rate of collocations in 19 texts, mainly from London Lund Corpus of Spoken English and Lancaster-Oslo/Bergen Corpus of written British English, was calculated, and it was found that 55.38% of the texts were composed of pre-constructed collocations (Erman and Warren 2000). This result shows that the idiom principle, which Sinclair (1991) described, is activated in the text shown above. When we memorize words which name things, that is, nouns, what should we do? In the struggle to memorize words, Lewis (2000:15) claims that much of language teaching, over the years, has been based on an assumed dichotomy of grammar and vocabulary: master the grammar system, learn lots of words then you will be able to talk about whatever you want. This traditional view of language has encouraged students to learn to name a lot of things and develop an extensive vocabulary which consists predominantly of nouns. Grammar is seen, in this view, as a means of using vocabulary in communication. Even though the meaning of nouns may be understood, learners obviously find it difficult to engage effectively in written or spoken communication. A plausible explanation of this difficulty is a lack of knowledge about collocations since these language patterns comprise much of spoken and written English. However, a simple list by list learning of collocations does not diminish the formidable challenge of language learning�there are more collocations than there are words because one word may be a component of a great number of collocations. Thus, principled approaches to collocation-based language learning need to be explored (Lewis 2000). Since it is true that verbs are the main grammatical elements of a sentence, our current research on teaching corpus-based collocations focuses mainly on verb-based collocations; i.e. verbs are given to the students first and then, the other words which collocate with the verbs are presented. It may be argued that the focus on verb-centered collocation patterns is most suitable for learners of Spanish at beginning levels who are in the process of learning the most frequent words of their target language. On the other hand, university-level EFL learners, with six years of English learning experience, found it useful to acquire collocation patterns with lower frequency nouns in order to become proficient in the use of academic English (Ishikawa et al. 2007). Finally, the third perspective is that since all words occur in collocation patterns, teaching collocations may be efficient ways to teach aspects of language other than vocabulary. Collocation-based teaching may usefully include instruction and practice in pronunciation at segmental and supra segmental levels. Unlike EFL students who have six years of English study prior to university entrance, Spanish is a language which Japanese university students learn from the very beginning in the first years of undergraduate studies and therefore, a focus on verb-centered collocation patterns would be suitable. In order for Japanese students to write reports or graduation theses in Spanish, they need to have a sufficient knowledge of academic verbs and their collocates as they are used in academic settings. 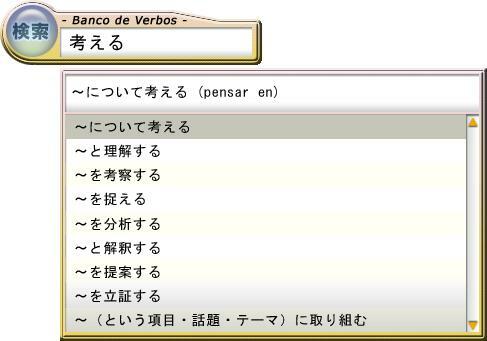 A common way for Japanese students to learn academic Spanish verbs and their collocation-based vocabulary is to look for such verbs and vocabulary in Japanese-Spanish dictionaries. Unfortunately, Japanese-Spanish dictionaries published in Japan often do not have enough phrases to help Japanese students write reports or graduation theses in Spanish. This is the reason why we developed a pronunciation and vocabulary teaching aid for Spanish as a Foreign Language programs. Bax (2003) refers to a future normalization stage in the development of CALL teaching methodology in which CALL materials are neither isolated from the mainstream of classroom face-to-face (FtF) teaching in CALL labs nor used merely as supplementary materials to core FtF instruction but so completely integrated into all foreign language teaching that it would be unthinkable not to have CALL materials as a normal feature of all classroom learning. Although it is beyond the scope of this paper to report on a methodological extension of the CALL materials discussed here, it is likely that the materials will be used in Blended Learning approaches, a combination of CALL and face-to-face teaching (Neumeier 2003). For example, it is probable that the pronunciation skill development of students using CALL materials would be monitored and supported by teachers in classroom settings. Indeed, sustainable motivation in independent CALL learning situations may depend in part working out appropriate balances in the use of learning materials independently and in teacher-student collaboration, as is necessary in distance learning (Moore and Kearsley 1996). However, as Stracke (2007) reports in a study of student dissatisfaction with a Blended Learning environment, the development of methodologies which integrate CALL and FtF instruction needs to be carefully worked out, even on an individual student basis. facilitating memorization and fluent use of verb collocation-based vocabulary through pronunciation training. In order to achieve the above three objectives, a user-friendly verb-collocation based Spanish vocabulary teaching aid using a Spanish speech recognition system for Japanese university students and a corpus of academic Spanish was developed. We developed a Spanish speech recognition system for Japanese university students based on the AmiVoice Japanese pronunciation recognition system by Advanced Media Incorporated. Speech data of 17 Spanish native speakers (5 males, 12 females) and speech data of 54 Japanese university students (13 males, 41 females) were collected. Since the speech data of Spanish native speakers are perfectly intelligible, only the speech data of Japanese university students were scored on a range from 1 (hardly intelligible) to 4 (perfectly intelligible) by two Spanish native-speaking foreign language teachers. The rate of inter-rater reliability of the scores by the two Spanish native-speaking teachers was r = 0.96. Spanish phonemes which are inconsistent with Japanese phonemes were replaced with the Japanese phonemes they coincide with. Spanish phonemes which do not exist in Japanese were replaced with very similar Japanese phonemes. By means of a speech recognition system which implemented the above pronunciation lexicon, the speech data of Spanish native speakers and Japanese university students were evaluated. As a result, only 29.63% of the speech data of Spanish native speakers were perfectly intelligible by the speech recognition system, while the speech data of Japanese university students were perfectly intelligible at the rate of 77.40% by the speech recognition system. In order to enhance the degree of accuracy for the speech data of Spanish native speakers, MLLR (maximum likelihood linear regression) and MAP (maximum posterior probability estimation) were adapted to the speech recognition system described in section 3.1.2. Fig. 1 shows the effect of MLLR and MAP adaptations for the speech data of Spanish native speakers and Fig. 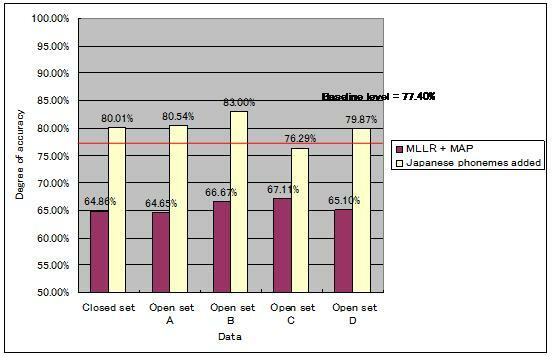 2 shows the effect of MLLR and MAP adaptations for the speech data of Japanese university students. Figure 1. The effect of MLLR + MAP for the speech data of Spanish native speakers. Figure 2. The effect of MLLR + MAP for the speech data of Japanese university students. Using MLLR and MAP adaptations, the degree of accuracy for the speech data of Spanish native speakers was shown to have remarkably improved; however, at the same time the speech data of the Japanese university students indicated deterioration. In order to improve the degree of accuracy for the speech data of Japanese university students, Japanese phonemes were added to the pronunciation lexicon described in section 3.1.2 and as a result, the degree of accuracy for the speech data of Japanese university students was shown to have improved as is shown in Fig. 3. Figure 3. The effect of MLLR + MAP + Japanese phonemes for the speech data of Japanese university students. A Spanish speech recognition system with the pronunciation lexicon described in section 3.1.2 as well as Japanese phonemes was included as a component of the teaching aid. Articles written by native speakers of Spanish in CUADERNOS CANELA, a Spanish-language academic journal published in Japan were used as the source of data for the development of a corpus. All the verbs were extracted from the data. Those extracted verbs were compared with a corpus of graduation theses written in Japanese by Japanese university students. 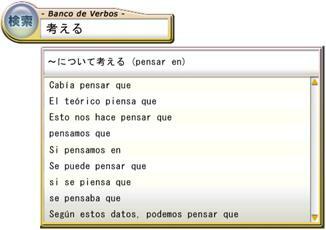 Taking into consideration the students' needs, a list of verb collocations was compiled. Fig. 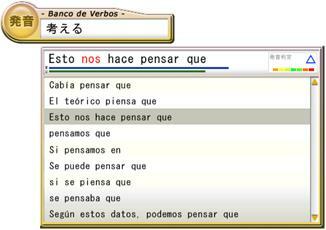 4 is an initial computer screen display of the teaching aid named �Banco de Verbos.� Students insert a Japanese word which they want to learn into a search box. Figure 4. An initial computer screen display of the teaching aid. After students insert into a search box a Japanese word which they want to learn, they can see and choose a selection of academic Japanese vocabulary. Fig. 5 is a computer screen display that shows a selection of academic Japanese vocabulary related to a Japanese word �kanga-eru,� which means �to think� in English. Figure 5. A computer screen display of a selection of academic Japanese vocabulary. 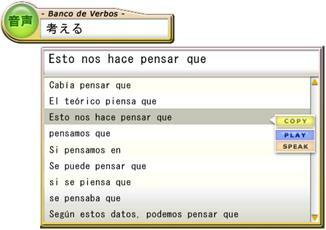 After students choose an item of academic Japanese vocabulary which they want to learn in Spanish, they perform a simple mouse click on the desired academic Japanese vocabulary item in order to see verb collocation-based Spanish phrases which include Spanish verbs relevant to the academic Japanese vocabulary that students choose. Fig.6 shows a list of Spanish phrases. Figure 6. A computer screen display of verb-collocation based Spanish phrases. If students highlight a Spanish phrase that they want to learn, they will see three buttons appear on the right end of the phrase, e.g. �COPY,� �PLAY� and �SPEAK.� Fig. 7 is a computer screen display of the three buttons. Figure 7. A computer screen display of three buttons popped up. If students select the �COPY� button, they are able to copy and paste the highlighted Spanish phrase into the text of their report or graduation thesis. If students select the button �PLAY,� they are able to listen to the Spanish phrase that they choose. If they select the �SPEAK� button and they say the phrase, their pronunciation and their utterance speed are evaluated by a Spanish speech recognition system (described in sections 3.1, 5.2, and 5.3). The effects of students' listening training are transferred to their pronunciation ability, and similarly, students' pronunciation ability is transferred to their listening training. Moreover, listening training is more effective when phrases rather than single words are used. This is because the phonology and meaning can be inferred when phrases rather than single words are used (Ikuma et al. 2004). The teaching aid configures four levels for the evaluation of students' pronunciation. Four different figures were installed according to the four levels. In addition to the above four figures that indicate the four levels of the evaluation of students' pronunciation, any word which was inaccurately pronounced is coloured red as is shown in Fig. 8. Figure 8. A computer screen display of the teaching aid evaluating a student's pronunciation. Two bar graphs under the Spanish phrase in Fig. 8 indicate the utterance length: The upper one shows the model utterance and the lower one shows the students' utterance. We define an utterance as a meaning unit and we divide all Spanish phrases in the teaching aid into meaning units. By requiring students to match the model utterance length, that is, to follow the rate of the model utterance as well as to imitate the stress and other intonation features repeatedly, it is expected that Japanese students will be trained to speak Spanish more fluently. At the present time, this multimedia teaching aid is available only in the classroom. In the near future, it will be stored in an e-learning server and will be accessible not only from the classroom but also from students' homes. We also plan to collect data regarding the students' access to the server and the evaluation of their pronunciation training so that we can gain a better understanding of students' progress and also determine which sections of the teaching aid require improvements. The second future project will be to try to develop systems which will promote effective memorization by students of vocabulary based on the feedback on pronunciation proficiency by the Spanish speech recognition system. In addition, we hope that our research will contribute to developments in Blended Learning (BL) methodologies which, as defined by Neumeier (2003), is a combination of face-to-face teaching and computer-assisted learning in a single teaching and learning environment. The aims of our CALL research in collocation-based pronunciation teaching are related to productive language use situations in face to face classroom discussions of students' graduation theses. Thus, further research which might shed light upon optimal BL conditions would be welcome. In particular, exploration is needed on how CALL teaching aids, which encourage and support outside-the-classroom independent learning, can be integrated into face-to-face components of academic foreign language courses by developing BL classroom materials, teaching strategies, and learning activities. Bax, S. (2003) CALL-past, present and future. System, 31:13-28. Erman, B and Warren, B. (2000) The idiom principle and the open-choice principle, Text, 20, 29-62. Ikuma, Y. and Akahane-Yamada, R. (2004) An empirical study on the effects of acoustic and semantic contexts on perceptual learning of L2 phonemes, Annual Review of English Language Education in Japan, 15: 101-108. Ishikawa, Y., Akano, I., Tateiwa, R. (2007) Development of a noun collocation-based English vocabulary teaching aid using the AmiVoice speech recognition system, presentation for EUROCALL 2007. Lewis, M. (ed.) (2000) Teaching collocation: further developments in the lexical approach. Hove: Language Teaching Publications. Moore, M. and Kearsley, G. (1996)Distance Education: A Systems View. Belmont : Wadsworth . Nattinger, J. R. and DeCarrio, J. S. (1992) Lexical phrase and language teaching. Oxford: Oxford University Press. Neumeier, P. (2003) A closer look at blended learning�parameters for designing a blended learning environment for language learning and teaching. ReCALL , 17/2, 163-178. Sinclair, J. (1991) Corpus, concordance, collocation. Oxford: Oxford University Press. Stracke, E. (2007) A road to understanding: A qualitative study into why learners drop out of a blended language learning (BLL) environment. ReCALL, 19/1, 57-78. Almela, R. et.al. (2005) Frecuencias del español. Madrid: Editorial Universitas. Bolinger, D. (1976) Meaning and memory, Forum Linguisticum, 1: 1-14. Chambers, A. and O'Sullivan, I. (2004) Corpus consultation and advanced learners' writing skills in French, ReCALL, 16/1, 158-172. Chapelle, C. A. (2001) Computer applications in second language acquisition: foundations for teaching, testing and research. Cambridge: Cambridge University Press. 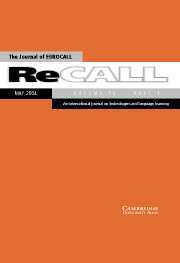 Coll, J. F. (2002) Richness of semantic encoding in a hypermedia-assisted instructional environment for ESP: effects on incidental vocabulary retention among learners with low ability in the target language, ReCALL, 14/2, 263-282. Coxhead, A. (2000) A New Academic Word List. TESOL Quarterly, 34/2, 213-238. Dodigovic, M. (2005) Vocabulary profiling with electronic corpora: a case study in computer assisted needs analysis, Computer Assisted Language Learning, 18/5, 443-455. Hunston, S. and Grancis, G. (1999)Pattern grammar: a corpus-driven approach to the lexical grammar of English. Amsterdam: John Benjamin. Jespersen, O. (1924) The philosophy of grammar. London: George Allen & Unwin. Kaur, J. and Hegelheimer, V. (2005) ESL students' use of concordance in the transfer of academic word knowledge: an exploratory study, Computer Assisted Language Learning, 18/4, 287-310. Kiernan, P. and Aizawa, K. (2004) Cell phone in task based learning: are cell phone useful language learning tools? ReCALL, 16/1, 71-84. Lister, B. and Smith, T. (2001) Learning Latin by electronic media: edging into the future, CALICO Journal, 18/2, 235-248. Nation, I. S. P. (2001) Learning vocabulary in another language. Cambridge: Cambridge University Press. Pawley, A. and Syder, F. H. (1983) Two puzzles for linguistics theory: native-like selection and nativelike fluency. In Richards, J. C. and Schmidt, R. W. (eds. ), Language and communication. London : Longman, 191-226. Pennington, M. C. (ed.) (1996) The power of CALL . Houston: Athelstan. Schmitt, N. (2001) Vocabulary in language teaching. Cambridge: Cambridge University Press. Thornbury, S. (2004) Natural grammar: the keywords of English and how they work. Oxford: Oxford University Press. Wray, A. (2002) Formulaic language and the lexicon. Cambridge: Cambridge University Press. As the title suggests, the concept of Computer-Supported Collaborative Language Learning (CSCLL) adopts and shares many aspects of Computer-Supported Collaborative Learning (CSCL). This article is an attempt to incorporate CSCL in English as a Second Language (ESL) and English as a Foreign Language (EFL) contexts, and to examine the potential applicability of CSCL in ESL and EFL classes. The goal of this article is to examine potential effects of CSCL in ESL and EFL. To validate its usefulness, the theoretical framework of CSCL and the effects of collaboration in language learning are introduced. With guidelines for task design, a sample of CSCLL is presented. The specific description of the sample is designed to enhance the ESL and EFL teachers' understanding and to motivate them to use CSCLL in their teaching contexts. Practical tips for classroom implementation will be also included. In addition, potential benefits and limitations are discussed. Among these are increased authenticity, eliciting students' active participation and interaction, flexibility, reduced anxiety and higher motivation, scaffolding and collaboration, learner-centeredness, developing electronic literacy and promoting ownership and personal responsibility by webpublishing. Affordability, practicality and heavy work-load for the teachers can be considered as potential limitations. Finally, pedagogical implications for teachers and researchers are suggested. Since socioconstructivism has become the major learning theory in the field of education as well as in second and foreign language education, the concept of collaboration has gotten attention from researchers and educators. Thus, many studies on collaborative learning have been conducted and many teachers are trying to incorporate the concept in their instructions as the studies gain more positive results. Moreover, as students are living in a high-tech century, they are getting familiar with using technology and in a way it is necessary for them to have a certain level of computer skills. In the academic world, using technology in terms of researching, communicating and having conferences have become common practice. Thus, a new literacy, electronic literacy or technology-related literacy, is needed for students to study further and to communicate effectively within their discourse community. In this article, the definition of CSCL and its theoretical background will be presented. Its benefits are also mentioned. Then, important features of language learning and its relationship with collaboration will be described. Also, positive research results on collaborative language learning will be introduced. Then, the project, Computer Supported Collaborative Language Learning (CSCLL), which was developed by the author, will be introduced. Sample activities with specific descriptions are also presented. Tips for classroom implementation will be mentioned. Finally, potential benefits and limitations, and pedagogical implications and suggestions will be discussed. According to Hsiao (2000), Computer-Supported Collaborative Learning (CSCL) has grown out of wider research into Computer-Supported Collaborative Work (CSCW) and collaborative learning. CSCW is defined as a computer-based network system that supports group work in a common task and provides a shared interface for groups to work with (Ellis et al. 1991). Collaborative learning is defined as groups working together for a common purpose. They are both based on the promise that computer supported systems can support and facilitate group processes and group dynamics in ways that are not achievable by face-to-face communication, but they are not designed to replace face-to-face communication. CSCL and CSCW systems are typically tailored for use by multiple learners working at the same workstation or across networked machines. These systems can support communicating ideas and information, accessing information and documents, and providing feedback on problem-solving activities. The research of CSCL and CSCW covers not only the techniques of the groupware but also their social, psychological, organizational, and educational effects (Hsiao, 2000). Thus, CSCL is a combination of computer science, education, and psychology as the following figure shows (Wasson, 1998). CSCL adopts several theories as the theoretical framework: sociocultural theory, constructivism theory, self-regulation learning, situated cognition, cognitive apprenticeship, problem-based learning, cognitive flexibility theory and distributed cognition (Hsiao, 2000). Among them, only the four concepts that seem to be mutually related to second or foreign language acquisition, will be discussed in this section. The constructivist theory of learning views that individuals are active agents, they engage in their own knowledge construction by integrating new information into their schema, and by associating and representing it in a meaningful way. The constructivist approach to learning emphasizes authentic, challenging projects that include students, teachers and experts in the learning community. Its goal is to create learning communities that are more closely related to the collaborative practice of the real world. In an authentic environment, learners assume the responsibilities of their own learning. They have to develop metacognitive abilities to monitor and direct their own learning and performance. When people work collaboratively in an authentic activity, they bring their own framework and perspectives to the activity. They can see a problem from different perspectives, and are able to negotiate and generate meanings and solutions through shared understanding. The constructivist paradigm has led us to understand how learning can be facilitated through certain types of engaging, constructive activities. This model of learning emphasizes meaning-making through active participation in socially, culturally, historically, and politically situated contexts. A crucial element of active participation is dialog in shared experiences, through which situated collaborative activities, such as modeling, discourse and decision making, are necessary to support the negotiation and creation of meaning and understanding (Hsiao, 2000). Cognitive apprenticeship is a term for the instructional process that teachers provide and support students with scaffolds as the students develop cognitive strategies. Wilson and Cole (1994) describe the core characteristics of cognitive apprenticeship models: heuristic content, situated learning, modeling, coaching, articulation, reflection, exploration, and order in increasing complexity. Cognitive apprenticeship is a culture that permits peers to learn through their interactions, to build stories about common experiences, and to share the knowledge building experiences with the group. Collaborative discussion occurring in CSCL is important for student learning because it activates prior knowledge which facilitates the processing of new information. CSCL is designed to help students with acquiring cognitive and metacognitive knowledge by means of observation and guided practice (Collins et al, 1989). Problem-based learning (PBL), anchored instruction, is a student-centered, contextualized approach to schooling. In this approach, learning begins with a problem to be solved rather than content to be mastered. This is consistent with new models of teaching and learning that suggest the emphasis of instruction needs to shift from teaching as knowledge transmission to less teacher-dependent learning. PBL emphasizes the importance of creating an anchor or focus that generates interest and enables students to identify and define problems and to pay attention to their own perception and comprehension of these problems (Bransford, J.D. et al, 1990). Pantiz categorized the benefits of CSCL in terms of academic, social and psychological aspects. �the research done up to the present has shown enough positive effects of cooperative learning, on a variety of outcomes, to force us to re-exam traditional instruction practices. We can no longer ignore the potential power of the peer group, perhaps the one remaining free resource for improving schools. We can no longer see the class as 20 or more individuals whose only instructionally useful interactions are with the teacher, where peer interactions are unstructured or off-task. On the other hand, at least for achievement, we now know that simply allowing students to work together is unlikely to capture the power of the peer group to motivate students to perform (p.128). There are several criteria on task development. However, in this article, the two criteria, sociocollaborative learning task design and Multimedia CALL criteria, which are the basis of the task design of the project, will be the prime focus. Making key linguistic characteristics salient. Offering modifications of linguistic input. Providing opportunities for learners to notice their errors. Providing opportunities for learners to correct their linguistic output. Supporting modified interaction between the learner and the computer. Acting as a participant in L2 tasks. Figure 2. CSCLL Homepage (1). Blackboard was used as the course management tool, with links to the students' blogs, a Wiki to upload their products and a discussion board for out-of-class communication. The following table shows the technological tools and their functions, which students will use in the project. Table 1. Tools and functions. In this module (2), each team is designed to develop a WebQeust. In the 'Course Document' menu, students can retrieve information which is needed to complete the module by clicking the 'Module 4' document. Since this is the last module, it is more complicated in terms of using technological tools and making the final product. The following is the assignment that the students are required to do in 'Module 4'. To understand strategies and techniques for collaborative Web-based inquiry. To understand the purpose and structure of WebQuest. To collaboratively design a WebQuest that meets stated criteria. Create a WebQuest related to a topic or question of interest to you and your team members. The WebQuest should be up on Discussion Board. When your WebQuest is completed, email it to all your class mates. You need to plan and organize the project. Your first step is to decide which member of the team will serve as the team leader for this project. The team leader's role will be to serve as a facilitator and coordinator of the project. There may be other roles that are important to your team based on their areas of expertise and interest. You may want to have one member who has strong technology skills to help in making a link of the WebQuest in the 'Discussion Board'. You will also need to decide how you will divide the tasks among the team to be sure that you develop a high quality WebQuest within the project timelines. After deciding on the topic, you can choose a template from this website: http://www.webquest.org/index-create.php. Identify the questions that are of the greatest interest to you or for which you or your teammates may have some expertise. Deciding upon the topic or question that you will address in your WebQuest is the first step in developing your WebQuest. The topic should be one in which there is shared interest in your team. Preferably, it should be a topic that would be helpful to educators and might relate to some aspect of collaborative or online learning. Other topics of high interest to the group may also be considered. Suggest questions or topics that you feel might be of potential interest to your team. Also identify any expertise that members of your team may have related to the topic or question. Select a team project leader. Choose one member from your team to serve as the team leader for the WebQuest project who was not the leader for other assignments. Select a technology guru who will be the lead technology person on the team. This person will help in placing the WebQuest on the 'Discussion Board'. Clarify the question or topic that your WebQuest will address. It is important for your team to be clear about the question or topic and its scope. Decide on Team member task assignments. The members of the team, facilitated by the project team leader, will decide on the tasks that must be done to complete the project. Each member of the team should have a clear idea of the area of responsibility and tasks that he or she will perform. Each of the questions, issues, or topics identified for the WebQuest are broad in scope and before you begin your research it is helpful to think about the specific questions that relate to the broad question. Develop a list of questions that you feel are important to answer in addressing the major question or issues. The more comprehensive your listing of related questions, the more focused your research will beand the more coherent, clear and concise your section of the paper addressing the broad question will be. To help you conceptualize your paper, develop a mind or concept map of the questions that relate to your broad question. Concept Mapping Tool. Inspiration is probably the most widely known and used graphic organizer tool used for concept mapping and other purposes. If you do not have access to Inspiration, you can download and use a trial version for 30 days. To download the trial version, go to Inspiration home page and click on Download Free Trial. You can also find other helpful information about concept maps at the Inspiration web site. Think strategically about how you will organize your search for information related to the specific topics or questions you will address in your section of the paper. What descriptors will you use for your online searches? What search engines may be most helpful? In addition to the usual search engines such as Google, Yahoo, Alta Vista, Excite, and WebCrawler, you may also want to consider HotWired.com. As you plan your search, talk to others to get their suggestions and ideas for possible information sources or relevant topics. Now that you have a clear idea of the information you will need for your component of the WebQuest, you can begin the task of finding and gathering the needed information. Be systematic as you gather information and list each reference source, including the URL, that will be included in your WebQuest. Also, be sure to make notes of the relevant information from the source that you will use in the WebQuest. Sharing Ideas and Resources with Team Members. As you are gathering information related to your specific topics or questions, be mindful of the information that is relevant to the topics or issues that are addressed by your teammates. One of the powerful aspects of working in a collaborative learning team is that, as you are doing research for your own project, you may discover resources that will be helpful to other members of your team in developing their component of the WebQuest. As you gather the information from the Web and other sources, you should begin to organize and store the information into the specific categories related to your questions or topics. Now that you have gathered substantial information related to your topic or question, you will need to view it from different perspectives and to combine and recombine the information elements in ways that help you better understand the topic or question. As noted by McKenzie (2000), like pieces of a jigsaw puzzle, you will rearrange the information elements you have gathered until a clear picture emerges. At this point you will be able to see the big picture and determine the extent to which you feel you are able to address your specific questions or topics. Are there any gaps in the information? Are there weaknesses? Are there remaining points or issues that you still do not understand? Are there holes in the logic of evidence? Based on your answers to these questions, you may do some additional information gathering to specifically address the gaps or weaknesses. You will very likely start developing your component of the WebQuest even while you are doing the synthesizing and evaluating. Often the gaps or weaknesses in the development of the answers or differing perspectives related to the question are not made evident until you start developing the final coherent WebQuest. Don't feel that you cannot share your work with others until you are satisfied that your WebQuest is entirely complete and polished. It is often helpful to share your initial version with others to help you to clarify issues, develop ideas and identify other helpful information resources. You should also consistently read the WebQuests of other teams to give them helpful feedback and encouragement. After completing the module, each student will participate in the evaluation process: self-evaluation, peer-evaluation, product-evaluation for both their and other teams' WebQuest. The following are rubrics for each evaluation. Always does assigned work without reminders. Usually does assigned work. Seldom needs reminders. Rarely completes assigned work. Needs frequent reminders. Always relies on others to complete work. Listens and speaks an equal amount. Listens. Occasionally talks too much. Does most of the talking. Seldom allows others to speak. Always talking. Never allows others to speak. Performs all duties of assigned role. Performs nearly all duties of assigned role. Performs few duties of assigned role. Does not perform duties of assigned role. Never argues with group members. Helps group reach mutual decision. Rarely argues with group members. Considers all views. Sometimes argues. Sides with friends and does not consider all views. Usually argues with group members. Wants to have things their way. Table 2. Self Evaluation Rubric. Table 3. Peer Evaluation Rubric. This refers to the WebQuest page itself, not the external resources linked to it. Background is gray. There are few or no graphic elements. No variation in layout or typography. Color is garish and/or typographic variations are overused and legibility suffers. There are a few graphic elements. There is some variation in type size, color, and layout. Appealing graphic elements are included appropriately. Differences in type size and/or color are used well. Introduction is purely factual, with no appeal to relevance or social importance. Introduction relates somewhat to the learner's interests and/or describes a compelling question or problem. The Introduction draws the reader into the lesson by relating to the learner's interests or goals and/or engagingly describing a compelling question or problem. Introduction doesn't prepare the reader for what is to come, or build on what the learner already knows. Introduction makes some reference to learner's prior knowledge and previews to some extent what the lesson is about. The Introduction builds on learner's prior knowledge by explicitly mentioning important concepts or principles, and effectively prepares the learner for the lesson by foreshadowing new concepts and principles. The task is the end result of student efforts, not the steps involved in getting there. Task requires simply comprehending web pages and answering questions. Task requires analysis of information and/or putting together information from several sources. Task requires synthesis of multiple sources of information, and/or taking a position, and/or going beyond the data given and making a generalization or creative product. Task requires simple verbal or written response. Task requires use of word processing or simple presentation software. Task requires use of multimedia software, video, or conferencing. The process is the step-by-step description of how students will accomplish the task. Process is not clearly stated. Students would not know exactly what they were supposed to do just from reading this. Some directions are given, but there is missing information. Students might be confused. Every step is clearly stated. Most students would know exactly where they were in the process and what to do next. Few steps, no separate roles assigned. Some separate tasks or roles assigned. More complex activities required. Lots of variety in the activities performed. Different roles and perspectives are taken. Note: you should evaluate all resources linked to the page, even if they are in sections other than the Resources block. Also note that books, video and other offline resources can and should be used where appropriate. Moderate number of resources used. Many resources provided, including off-line resources. Links are mundane. They lead to information that could be found in a classroom encyclopedia. Some links carry information not ordinarily found in a classroom. Links make excellent use of the Web's timeliness and colorfulness. Students have no idea on how they'll be judged. Criteria for success are at least partially described. Criteria for gradations of success are clearly stated, perhaps in the form of a rubric for self-, peer-, or teacher use. Table 4. WebQuest Evaluation Rubric- your team. Table 5. WebQuest Evaluation Rubric- the other team. Teachers can modify each module depending on the class objectives, students' level of language proficiency, and technology assistance. Teachers also can combine CSCLL in the regular class instruction as on-line and off-line classes. Teachers can also use only the CSCLL as the main instruction as in a distance learning context. Since it is likely that most of the students are not familiar with the instruction in terms of using technological tools for communication with the teacher and team members, developing and uploading final projects, and evaluation, it is very important to have a practice or demonstration period with simple tasks at the beginning of the course. It is also important for teachers to give immediate feedback to the students when they have problems with technology use as well as content knowledge learning to motivate students for continuous engagement. In addition, since most of the work should be done by each team's collaboration, the effort from both the teachers and students to maintain a supportive group environment for successful collaboration and facilitative communication is also important. Specifically for the 'Module 4', it is also suggested that if the students are recommended to read the evaluation rubrics before they develop the WebQuest, it would be helpful for them to make decisions on what to focus and how to develop the WebQuest according to the stated criteria. Concerning technological tools, blogs can be used as eportfolios to save students' work and check what they have achieved at the end of the course. Teachers can develop a class webpage as the course management tool, or they can use the Wiki or a blog as the course management tool. 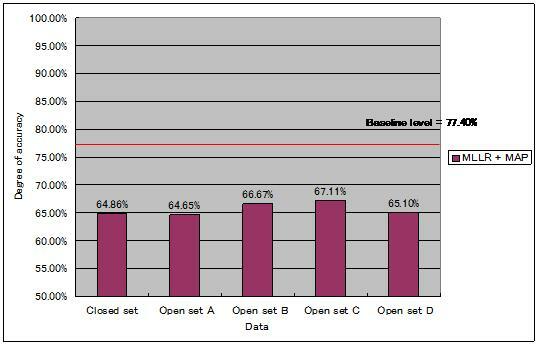 Teachers also can develop online evaluation using Survey Monkey. There are several potential benefits on CSCLL. Authenticity: CSCLL tasks use authentic materials with vivid audio-visual aids and also encourage students to use various technological tools for their learning. Active participation and interaction: students are learning by actively doing the task. This helps long-term memory. Flexibility: for the students, they can choose subtopics, the mode of communication, and the content of the report depending on the tasks. For the teacher, they can design tasks depending on the students' needs and class objectives. Scaffolding & collaboration: CSCLL itself is designed to foster collaboration which gives the students opportunities to learn from each other. Learner-centeredness: the task should be done by the students, so they have control over their learning. Reduced anxiety and higher motivation: as other Computer-Mediated Communication (CMC) tasks, students will have less anxiety and higher motivation while they are communicating in CMC environments. Electronic literacy: by reading and writing online and using various technological tools in the process of goal accomplishment, students will enhance their electronic or technology-related literacy. Ownership and personal responsibility: by webpublishing on the Wiki and a blog, students can have ownership and personal responsibility of their writings. Meta-cognitive skills: by writing a reflection journal on their blogs, students can enhance meta-cognitive skills on their learning process as well as critical thinking skills on the topics. Affordances (Hampel, 2006) and practicality: as other CALL classes, teachers should consider the affordances in terms of tool availability and internet access. Moreover, since it requires a lot of time and effort, the teachers should also consider its practicality and pedagogical effectiveness in designing and implementing a task. A lot of work for teachers: it is the teacher's main job from designing a pedagogically sound task to implementing it in an actual class. To be successful, the teacher should be very knowledgeable not only on SLA theories and task design, but also on technical skills for better choice of the medium of instruction. It is also recommended for teachers to be aware of students' needs and their characteristics. The possibility of lack of access to the Internet via a fast and reliable connection. Keeping a supportive and collaborative learning community: Since all the work is done by collaboration, it is crucial to keep a supportive learning community for the success of the course. Thus, it needs consistent efforts to consciously and unconsciously maintain such environments from the teachers and the students. However, sometimes it is hard to keep such a friendly environment, especially when the students are from different cultures. Thus, it is recommended to develop a protocol to compensate for conflicts. CSCLL is an appropriate language learning environment to foster students' communicative skills. Since all the work should be done by collaboration with group discussion, students can have a lot of opportunities to negotiate meaning (Long, 1985) and to be exposed to 'i+1' input (Krashen, 1985) of more proficient students. Those are essential elements to develop communicative skills. Moreover, students can develop critical thinking skills by participating in problem-solving processes of the tasks. Students can also develop meta-cognitive skills by reflecting on their learning on the blogs at the end of each module and giving and receiving feedback from peers and the teacher. Various uses of technological tools to complete each module lead students to have technology-related literacy. And while they are doing research, they can also develop content knowledge. The concept of CSCL can be applied to disciplines other than ESL and EFL, such as maths and science, because of its high flexibility in terms of creating tasks and using technological tools. The goal of this article has been to examine the potential effects of CSCL in ESL and EFL contexts. To validate its usefulness, the theoretical framework of CSCL and the effects of collaboration in language learning were introduced. A specific description of the sample unit was included for ESL and EFL teachers to enhance their understanding and to motivate them to use CSCLL in their teaching contexts. CSCL might be a new instructional method for ESL and EFL teachers. Thus, CSCLL might be unfamiliar and even strange for them. However, CSCLL has no significant difference from other Computer-Assisted Language Learning (CALL) tasks and teaching methods. If the teachers have a desire or willingness to design innovative teaching materials or tasks using technology, there would be no critical difficulties in adopting CSCLL in their classroom instruction. The proposed program will enhance ESL and EFL learning while promoting students' collaboration and developing students' electronic literacy. Bejarano, Y. (1987) A cooperative small-group methodology in the language classroom. TESOL Quarterly. 21(3). Bransford, J. D., Vye, N., Kinzer, C., & Risko, R. (1990) Teaching thinking and content knowledge: Toward an integrated approach. In. B. Jones & L. Idol( Eds.) Dimensions of thinking and cognitive instruction (pp. 381-413). Hillsdale NJ: Erlbaum. Chapelle, C. A. (1998) Multimedia CALL: Lessons to be learned from research on instructed SLA . Language, Learning & Technology. 2(1). 21-39. Collins, A., Brown, J. S., & Newman, S. (1989) Cognitive apprenticeship: Teaching the craft of reading, writing, and mathematics. In L. B. Resnick (Ed. ), Knowing, learning, and instruction: Essays in honor of Robert Glaser. Hillsdale, NJ: Lawrence Erlbaum Associates, Inc.
Ellis, C. A., Gibbs, S. J., & Rein, G. L. (1991) Groupware: Some issues and experiences. Communications of the ACM, 34(1), 38-58. Hampel, R. (2006). Rethinking task design for the digital age: A framework for language teaching and learning in a synchronous online environment. ReCALL, 18(1): 105-121. Long, M. H. (1985). Input and second language acquisition theory. In Input in second language acquisition, ed. Susan Gass and C. Madden. Rowley, Mass: Newbury House. Meskill, C. (1999) Computers as Tools for Sociocollaborative Language Learning. In: Cameron, K. (ed. ), Computer assisted language learning (CALL): media, design and applications. Lisse: Swets & Zeitlinger, 141-162. Nunan, D. (eds.) (1992) Collaborative language Learning and Teaching. Cambridge: Cambridge University Press. Sharan, S. et al. (1984) Cooperative Learning in the Classroom: Research in Desegregated Schools. Hillsdale, N.J.: Erlbaum. Slavin, R. E. (1983) Cooperative Learning. New York: Longman. Stevens, R. J., N. A. Madden, R. E. Slavin, and A. M. Farnish. (1987) Cooperative integrated reading and coposition: two field experiments. Reading Research Quarterly. 22(4). Stevens, R. J., R. E. Slavin, and A. M. Farnish. (1991) The effects of cooperative learning and direct instruction in reading comprehension strategies on main idea identification. Journal of Educational Psychology, March. Vygotsky, L. S. (1978) Mind in society: The development of higher psychological processes (M. Cole, V. John-Steiner, S. Scribner , & E. Souberman, Eds.). Cambridge , MA : Harvard University Press. Warschauer (1999) Electronic Literacies: Language, Culture, and Power in Online Education. Lawrence Erlbaum Associates. Wilson, B., & Cole, P. (1994) An instructional-design review of cognitive teaching models. Paper presented at the meeting of the American Educational Research Association, Chicago, IL, April 1994. (1) To log in, you need to have an ID and password. Please contact the author if you need them. 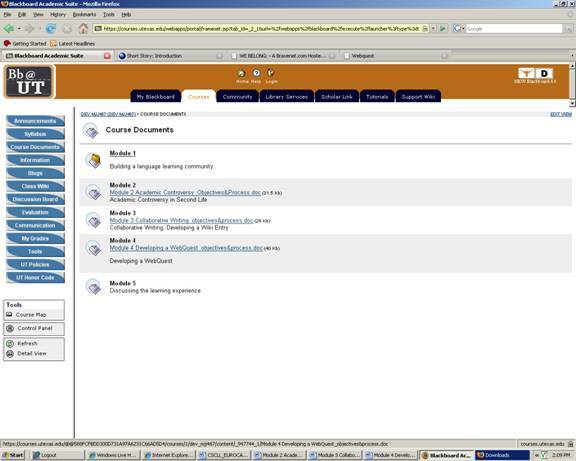 (2) This module modified tasks of a CSCL course (http://www.edb.utexas.edu/cscl/2007/welcome.htm). The Saudi education system is facing a climate of change characterized by an interest in integrating new technology and educational approaches to improve teaching and learning. In this climate, the present article explores the feasibility of introducing computer-assisted co-operative learning in government secondary schools in Unaizah, Saudi Arabia. In particular, it considers teacher experience with/attitudes towards such learning in teaching English as a foreign language; administrative support for such innovation and students' responses to a co-operative learning environment, based on interviews and observations. The author concludes that the introduction of computer-assisted co-operative learning in English, supported by appropriate training, could benefit both students and teachers and offers recommendations for its implementation. Computers can be very powerful tools in learning and teaching English as a foreign language (Mambretti, 1999; Al-Harbi, 2000). They can provide opportunities for students to learn cooperatively and use the language creatively for communicative purposes. This, in turn, will enhance their ability to construct learning and develop confidence and fluency in language use. Saudi Arabia has in the last two decades sought to implement technology in education, as part of the country's overall development and human resources strategy. Such efforts began with the introduction of computer studies as a trail subject in secondary schools in 1986. More recently, efforts and concerns have centred on developing teaching methodologies and on how computers may effectively assist in supporting and achieving educational goals (Sabbak, 1996). In early 2000 Crown Prince Abdullah announced the �Watani' project, an ambitious national project to incorporate computers and the Internet into school classrooms and lessons (Saudi Press Agency, 2000). These initiatives, however, are still in the early stages. This article considers the potential of computers for assisting teaching and learning English as a foreign language (EFL) in state-run boys' secondary schools in Saudi Arabia. It concludes with the view that computer technology can no longer be ignored. Saudi educators, in seizing the initiative to use computers in teaching English, have made an important step forward towards improving the educational process. The communicative approach to teaching claims that if second language acquisition replicates first language acquisition, or does so for the most part, then the teaching of second language should benefit from the same procedures and strategies exhibited by both L1 acquirers and natural L2 acquirers. The cornerstone of the communicative theory is that the learner has to use the target language as a medium of interaction. �[The] notion of direct rather than delayed practice of communicative acts is central to most CLT interpretations� (Richards and Rodgers, 1986:68). The learning or acquisition of rules �arises from constant practice on the communicative� (Little et al., 1994:460), activities involving both listening and speaking at the same time. Within such an approach, computer technology potentially has immense value, both as a source of �comprehensible input� (Krashen and Terrell, 1983) and as a medium for shaping and disseminating output which promotes fluency, encourages syntactic language processing and affords students opportunities to receive feedback from others (Swain, 1985). Moreover, the computer with its multimedia technology offers opportunities for successful collaborative learning and teamwork in small groups (SIIA report 2000), promoting interactive language teaching at the highest level (Felix, 1998). This potential, however, has yet to be realised in Saudi Arabia, for a variety of reasons: a rigid, overcrowded curriculum, lack of resources, and inadequate teacher preparation �particularly as in Saudi a graduate in any subject is considered automatically qualified to teach, without any specific training in pedagogy. Theoretically, the EFL textbooks prepared and supplied by the government espouse the communicative approach. However, few teachers seem able to cope with the 'challenging' directions given to them in the Teacher's Book (1994). In most schools, the textbook is the sole reference for the teacher and students (Al-Maini, 2006). Lessons are teacher-centred and the students are largely passive, with little chance to generate their own oral or written output to develop their linguistic and communicative skills. Activities and tasks are very limited, driven by an assessment system which relies heavily on memorization of grammar rules and formulaic sentence structures. Nevertheless, there are signs of change, as the following experiences demonstrate. During my fieldwork, I observed two examples of cooperative learning with ICT, in different schools. In one school, I observed a lesson taught by Maher, in the school's Learning Centre. The lesson was based on a reading passage in the textbook. However, Maher used the data projector to display the text. After the reading, he displayed comprehension questions and multiple choice answers using the projector. Students were divided into groups of about five, and given time to discuss and decide on their answers, Maher then played a CD, supplied by himself, to enable them to hear the correct answers with native (American) pronunciation. Although this lesson was based on the standard curriculum materials and followed the usual pattern of reading, explication and question�and�answer, the students appeared to be highly motivated by the provision of variety through this mode of delivery. They were all attentive and participated actively. In another school, an English teacher, Bander, had initiated an 'English Room' containing a computer and data projector. Observing an English lesson in that room was an enjoyable experience, with all students fully engaged and participating actively. Aware that students were bored with the traditional way of teaching. Bander had obtained permission from the headteacher to install the equipment in a spare room, at his own expense. Many Saudi teachers, however, are resisting technology implementation. Another English teacher, Yousef, was disinclined to use the school's computer centre, and benefit from it. He argued that with 20 classes to teach each week, he had no time to use the Centre; he seemed to view use of the learning centre as an extra chore that would have to be fitted in, in addition to his normal classroom teaching, rather than facilitating or even replacing some of his classroom activity. There are also teacher training issues, since he did not know what modern technology could offer and how its use might affect teaching and learning. Another view frequently expressed by teachers was that it is �forbidden� for teachers to introduce additional resources. One explanation may lie in concerns that the use of computers and access to the web can bring instant exposure to Western values. However, in the examples cited here, the content delivered was still that provided by the Ministry, i.e. the textbook and therefore ideologically acceptable. Institutional differences in the schools, such as the support of the headteacher, the availability of a room not timetabled for other purposes, or the general professional culture among the English teachers, also contributed to the different practices of teachers. However, at least some Saudi teachers are keen to move towards a more constructivist approach to teaching and learning. Although Maher and Bander did not depart from the approved curriculum content or radically change the lesson structure, their willingness to encourage more interaction among the students appeared to enhance both motivation and performance. It is notable, however, that both Maher and Bander had supplied their own resources; in Bandar's case, at considerable expense. The problem is that despite recent initiatives, funding is not available to equip every school. One headteacher, in a school which had no modern technological aids, so that English teachers depended completely on traditional teaching methods, was trying to enlist financial contributions from local businessmen to buy equipment and made it clear that he expected no help or support from the Ministry of Education. ICT is potentially valuable for learning, but particularly for listening skills, and through this, for pronunciation skills. It provides for accurate listening and controlled pronunciation with model voices, as well as helping students to overcome their shyness and giving them confidence to experiment with the language. In many Saudi schools, however, ICT is still infrequently used or even unavailable. In Unaizah, there are teachers who are willing and able to use it, and their EFL teaching is enriched as a result, but as yet these are mainly the privately funded efforts of a few pioneering individuals. Without a doubt we are in the centre of a �monumental technological paradigm shift, one which will eventually change the way that all instructors teach and the way students learn� (Jensen, 1993). While technology should not take over the language classroom, it must be embraced in order to allow educators to do those things which they are unable to do themselves, or those which will improve what is currently being done in the classroom. The cases cited here show that there is no ideological objection or obstacle in Saudi Arabia to the provision of additional, up-to-date resources, if funding can be found. Schools could solicit assistance from local businessmen in financing such modernization initiatives, step-by-step, beginning with smaller purchases and building up the resources of the school gradually. I also suggest that cooperation should be encouraged, within and between schools, to share and exchange resources. This would not only benefit the students, but might help to foster collegial relations and contribute in the development of a professional culture. Both these suggestions, admittedly, involve practices that, although not unknown, are rare in Saudi Arabia at present. In this respect, educational supervisors have a potentially important role to play, in their visits to schools, in encouraging such arrangements, both by explaining the benefits of such initiatives, and by making clear that there is no ideological objection to them. This is important in a culture where teachers are unaccustomed to taking initiatives and reluctant to act without permission. In this way it is to be hoped that gradually the values of creativity, initiative and cooperation would be promoted and embedded in the school culture. Al-Harbi, A. (2000) The Internet in Saudi Arabia, Jeddah: Al-Andalus Press. Al-Maini, Y.H. (2006) The Learning and Teaching of English as a Foreign Language with Particular Reference to Developing Reading Skills: a Case of a Saudi Secondary School, Ph.D. Thesis submitted to the University of East Anglia,UK. Jensen, R. (1993) The technology of the future is already here, Academe, July-August, 8-13. Krashen, S.D. & Terrell, T.D. (1983) The Natural Approach, Oxford: Pergamon Press. Little, D, Devitt, S. & Singleton, D. (1994) The communicative approach and authentic texts. In: A. Swarbrick (ed.) Teaching Modern Language, London: Routledge/Open University Press. Mambretti, C. (1999) Internet technology for schools, Jefferson: McFarland & Company, Inc.
Ministry of Education of Saudi Arabia (1994) Teacher's Book, Ministry of Education, Riyadh, Saudi Arabia. Richards, J.C. & Rodgers, T.S. (1986) Approaches and Methods in Language Teaching, Cambridge: Cambridge University Press. Sabbak. H. (1996) The Potential of using computers for language learning in the Kingdom of Saudi Arabia, unpublished Master's dissertation, University of Leeds. Swain, M. (1985) Communicative competence: some roles of comprehensible input and comprehensible output in its development. In: S. Gass & C. Madden (eds.) Input in Second Language Acquisition, Massachusetts Newbury House, Rowley, pp.235-253. This book explores different ways in which cultural awareness and cultural understanding can be promoted and successfully achieved by means of Content and Language Integrated Learning (CLIL), with a special focus on higher education. The authors of the different articles provide a theoretical background and practical examples in which content, culture and language learning are intertwined, illustrating how educators explore new ways of interactive and collaborative learning which encourage both instructors and learners to become multi-culturally aware and to make the most of a multicultural environment. In the preface, Carrió-Pastor points out the aim of this book: �to analyse the cultural aspects of content and language learning and the integration of different cultures in a new society in which communication and technology are the key aspects to be taken into consideration� (p. 8). This aim, fully achieved by the book, is particularly relevant nowadays, since 2009 was the European Year of Intercultural Dialogue. This means that active European citizenship is being increasingly promoted, and the contribution of this book to this goal is, as far as European higher education is concerned, to find innovative ways of integrating the teaching of foreign cultures and languages in the teaching strategies of content subjects. The first part of the book begins with an introduction by David Marsh aimed at putting CLIL into context and explaining the meaning of key words such as culture, education and CLIL, these definitions being deeply grounded in bibliography, although we miss some more references to more recent publications. Marsh opposes the maximalist perspective, which is a static, cross-cultural and monolithic view, to the minimalist one , which is intercultural, linked to situational analysis and to intercultural communication performance. After a deep analysis, the author concludes that the minimalist perspective is the one that should be promoted by CLIL methodologies. In addition to this, the author gives and anthropological definition of culture and relates culture to important terms such as intercultural societies, nation states, personality and situational adaptability. These terms are central to CLIL, in which �dynamism and realization of human interaction should be stressed whilst emphasizing the inseparability of language, communication and culture� (p. 27). 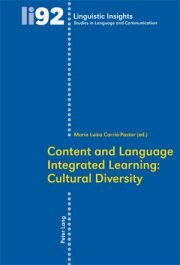 Following this introduction, María Luisa Carrió-Pastor's article �Cultural Diversity in Content and Language Integrated Learning (CLIL)� explores the role of cultural awareness when learning an L1 through an L2 culture, and the difficulties a student has to overcome in order to be fully socialised in a second culture and not just in a second language. The author underlines three factors to be taken into account to foster successful intercultural communication: Identity, Otherization and Representation, as well as other key CLIL-related factors such as developing new strategies to help students to adapt to the new needs in the communication era and including culture in our teaching materials. The next article, �Sharing CLIL in Europe�, written by Inmaculada Fontanet-Gómez and Miguel F. Ruiz-Garrido, presents the state of the art in European education systems, as a part of mainstream school education, within pilot studies or experimental projects, or both, as well as the different status of the languages involved in every country, i.e. from foreign to regional and minority languages. The authors also refer to the admission criteria, the subjects involved, and whether CLIL is introduced in primary, secondary, or higher education. This is followed by an overview of CLIL experiences in Spain, both in Secondary and higher education. The variety of experiences and methodologies used within the same country seems to show that CLIL is not yet fully implemented, and there is no common norm for its implementation. However, the results obtained so far are encouraging and illustrate how the CLIL approach to language learning is growing in Europe, with an increasing number of researchers and practitioners getting involved in CLIL practices and with more and more recommendations for �plurilingualism� in the European Union. The last article of this part is entitled �How can CLIL benefit from the Integration of Information and Communications Technologies?� Its author, Ana M. Gimeno Sanz, explores a variety of ways of integrating ICT into a CLIL classroom setting and illustrates how the InGenio online authoring tool and courseware delivery platform can be used in CLIL. According to the author, a crucial factor in designing dual purpose learning materials is the importance of close co-operation between the language specialist and the subject-matter specialist to design and implement pedagogically sound materials that serve the acquisition of knowledge in two disciplines. This article closes the first section of the book in a very adequate manner, clearly showing that there has been a progression from definitions and a more general perspective, in the previous articles, to the state of the art in European countries and, finally, to a specific application of the theory through the use of an online authoring tool and learning management system. The next section of the book, CLIL in practice, presents four case studies that describe the effects of culture and CLIL in different backgrounds. The first of these case studies is Do Coyle's �Promoting Cultural Diversity through Intercultural Understanding: A case study of CLIL Teacher Professional Development at In-service and Pre-service Levels�, which focuses on CLIL teacher training and the importance of moving ahead from cultural awareness to the development of cultural understanding and the intercultural competence. Do Coyle wittily refutes common beliefs that presuppose an �automatic link between learning a foreign language and becoming a world citizen� (p. 106), accepting the challenge of vindicating the role of �culture� in CLIL if intercultural learning and intercultural understanding are to be achieved. She proposes a 4Cs framework for conceptualizing CLIL (content, communication, cognition and culture), which �conceptualizes the integration of subject learning and language learning through developing intercultural understanding� (p. 109). She also suggests that students should develop intercultural competence, a step forward from cultural awareness that would enable them to act as mediators between different cultures. In the case study presented, the author describes how pre-service and in-service teachers go through two phases, one of awareness-raising and one of exploration of a professional development course. She concludes that the notion of intercultural teaching has to be addressed in all training programmes, and that the content of these programmes should be considered as an important contributor to CLIL teacher development. This is followed by a short case study entitled �Working across Boundaries with CLIL�, by Isabell Hodgson and Steven R. Jones, describing an experience that took place in several universities in the United Kingdom, Sweden and Finland. After a brief introduction of the institutions involved, the authors express the objective of the module taught, briefly explain what the module is comprised of, and finally discusses the results. Since this experience seems quite a complex and interesting one, it would have been good to have a more extensive explanation about the way the module was taught, followed by some bibliographical references. The next case study is provided by Tom Morton, under the title �Integrating Language and Content in Secondary CLIL History: the Potential of a Genre-based Approach�. This article, deeply grounded on bibliography and very well organised, points out the fact that explicit language teaching needs attention in CLIL and suggests that a good way to do this is by means of a genre-based approach. In this explicit approach, CLIL practices are further enhanced and enriched by an explicit approach to the teaching of features of secondary history genres. To illustrate this, the author presents several examples of actual history classes where students mixed different genres successfully in their oral presentations. Morton considers that �what was successfully accomplished could be enhanced and extended by the incorporation of a genre-based pedagogy� (p. 145). This could be done by promoting genre awareness with the help of CLIL materials with an explicit focus on subject-specific literacies by scaffolding students' comprehension and production. Joseba Ezeiza Ramos signs the last article, �Integrating Languages, Contents and Cultures in the European Space for Higher Education: from Theory to Practice�, a very theoretical compendium of lists which is the result of a thorough literature review on CLIL in the European Space of Higher Education (ESHE). Among the main topics the author looks at are intercultural awareness, Coyle's model of the four C's, European collaboration programmes, students' basic competences, key capacities to meet communicative demands, curricular elements, types of resources, criteria governing planning and development, and methodologies. The aim of these lists is to serve as guidelines that help us to face the renovation of methodological approaches required in order to suit the current needs of European multicultural societies, bearing in mind that universities have a responsibility in �helping to shape the political, economic, cultural and social identity of Europe� (p. 166) and that CLIL can make an enormous contribution to that goal. The overall impression we get from reading this book is that it addresses the CLIL approach from many different perspectives, providing worthy information that is valuable for different professionals, both experts and non-experts in this approach, in a very well organised and interconnected way, going from the general information to the practical examples of how theory can be successfully put into practice. Teaching Academic and Professional English Online represents a clarifying and dynamic view of the way in which the integration of ICT is transforming teaching and learning contexts. ICT in education have motivated changes in learning materials, changes in the role of teachers as mediators, facilitators and guides, and changes in the strategies used in order to make education more efficient and functional. The volume consists of nine contributions from different educational contexts and institutions; a compilation which clearly represents how language teaching professionals are devoting their efforts and experience to creating and designing online tasks and materials while sharing their opinions and concerns, and their empirical and practical experiences during the phases of design and implementation of projects and materials design. The contributions focus on the fields of both academic and professional English, which provides a more complete and representative view. María José Luzón, one of the editors, is also the author of the first chapter. Her contribution represents an introduction to the contents which are part of the book. She offers a dynamic and practical overview of some of the most relevant aspects concerning the field of learning academic and professional English online by dealing with the integration of technology, language learning, and disciplinary knowledge. This first part sheds light on the use of ICT in language learning contexts by dealing with all the factors which could affect the way in which English for Specific Purposes (ESP) is taught and learnt. Her contribution does not ignore the Bologna process. The aim of fostering mobility within the European Higher Education Area and �preparing students to become autonomous life-long learners� (p. 13) are seen as the main reasons why learning a second language, particularly English, has become one of the major demands within European students' curricula. New technologies and online resources are seen as the most useful and efficient alternatives to make language learning and practice easier and more functional. María José Luzón considers possible challenges and limitations, but also reflects on the flexibility and achievements accomplished during recent years. �Interaction and collaboration with authentic audiences and for authentic purposes while increasing students' motivation� (p. 16) and �the potential contribution to the development of autonomy and higher order thinking� (p. 18) are seen as the main advantages. The author also considers pedagogical principles that are relevant when designing learning environments such as the choice of technical features, methodological principles and conditions with the aim of setting goals and choosing the strategies to achieve them. The author also includes an overview of a number of online environments and tools for communication and collaboration which would increase the possibilities and benefits when learning a language by incorporating innovative solutions. Ruth Trinder reflects on the potential of blended learning environments and the way they could benefit language learning conditions. She very helpfully offers an explanatory definition and background information which clarifies the �blended learning� concept. The author also sets the basis for her research; the university context where the study has been conducted, as well as the participants' attitudes and expertise. She also offers a structured and personal overview of the materials which are part of the project, and schematically fixes language learning conditions and her research interest: �exploring those factors which impact on students' choices in a BL environment� (p. 39) and an attempt to �identify a set of criteria that potentially promote language learning� (p. 39). After this, the reader finds a dynamic presentation of the empirical case study, the procedure which has been followed and the results obtained, distributed according to scales by following a comparison between traditional or computer mediated interaction; interaction and negotiation of meaning, tasks, sources, learner choice and control, atmosphere, feedback and cognition. A combination of traditional and innovative possibilities seems to be the perfect option for language learning contexts according to the research study. After the results, the reader finds a section devoted to the discussion of the main issues and final conclusions, in which both premises and results are taken into consideration. Elisabet Arnó Macià, Carmen Rueda Ramos and Antonia Soler Cervera contribute with their experience in designing a virtual learning environment for students of English for Academic Purposes through the Quantum LEAP project (funded by the Catalan regional government - Generalitat de Catalunya). This group has devoted great effort in designing and developing teaching materials as an attempt to improve communication skills in a language learning context (complying with the Bologna guidelines of the European Higher Education Area). The aim of the project was to create a �flexible ICT tool that could be adapted to different learning modalities� (p. 58). The contribution shows the framework for the creation of this versatile tool by setting the basis and explaining the aims of a project which would support both face-to-face tuition and self-access learning. Among its multiple functionalities, students have access to an electronic portfolio allowing them to keep a record of their oral and written production, an important resource when trying to foster communication and oral production skills. Screenshots permit the reader to clearly visualise the tool's interface and distribution of content, which helps to better understand the theoretical issues. According to authors, the development of online materials can be seen as a way of promoting autonomy by means of �motivation, integration of web-based activities with other course activities, learner-centredness and scaffolding, and engagement in higher-level thinking and development strategies� (p. 62). This section also pays special attention to the way in which linguistic skills can be developed through innovative web-based teaching and learning environments. An overview of the way the tool could promote learning and develop reading, writing, listening and speaking skills. The authors mention some of the key factors which could promote student autonomy and offer some useful guidelines and recommendations for anybody interested in developing online materials. Ana Gimeno devotes her contribution to this compilation to presenting one of the major achievements of the CAMILLE Research Group (Universidad Politécnica de Valencia), the InGenio Project. She reflects upon the rapid expansion of teaching online in the 21st century, especially in terms of teaching languages, and particularly English. She also includes a very interesting issue directly connected with the learners' level of proficiency: it is thought that those who are �beginners or elementary learners prefer face-to-face tuition and classroom contact, whereas intermediate and advanced learners are more willing to explore autonomous learning scenarios� (p. 83). This idea could represent an explanation of the limited number of language teachers who try to create their own materials as a response to their specific needs. But the main aim of this article is geared towards presenting the InGenio tool as a pioneer �online authoring shell and an entirely web-based multilingual tool� (p. 84) which enables teachers from all around the world to develop and implement their own language courses and be able to respond to their specific teaching and contextual demands. The time of focusing on the learner rather than on the teacher when designing (web-based) materials has arrived. This is the reason why InGenio is presented as a robust and flexible tool which can �suit a large number of teaching methodologies� (p. 87), enabling its grapgical user interface and its content to be translated and adapted into as many source languages as need be. The creation of different types of exercises is possible by means of the multiple exercise templates available when using this authoring shell. Ana Gimeno also presents some other utilities and functionalities of the tool; the possibility of providing reference materials in order to make the learning process more dynamic, an explanation of how assessment is conducted, different feedback modalities, and the existence of an online tutor interface, which allows a personal control over students' progress. Screenshots and the presentation of an existing course for students of �Intermediate Online English� are the final points of a clearly structured presentation of the InGenio online tool. Mª Luisa Carrió Pastor analyses the fact of enhancing Learner-Teacher collaboration by using online activities. She reports about the positive clues of this collaborative attitude between the participants taking part in the learning process. The focus has been two-fold as there are two bases of study; learning and teaching. In the case of learning, �students would collaborate in the update of specific material, which would be appropriate to their needs� (p. 107). In the teaching section, the study would focus on the fact that �teachers from different areas of knowledge would collaborate in developing tasks that would reinforce language skills� (p. 107). The author remarks that combining the benefits of technology, the usefulness of a collaborative learning process and appropriate content and language integrated learning would increase the possibilities of succeeding in the final results as it would allow us to obtain �communicative, active, and professionally-oriented materials for specific contexts� (p. 108). Maria Luisa Carrió sets the theoretical bases of the collaborative language learning process and its connection with the context of CLIL (content and language integrated learning). Her work tries to be not only a clarifying view of the importance of collaboration between learners and teachers, but also a space for sharing experiences and recommendations in an attempt to �improve second language awareness and social interaction skills� (p. 113). This article includes other sections devoted to the process of material design and some real examples of practice through the implementation of CSCL and CLIL tasks. At the end, the fact that the efficiency of the research is proved by mentioning that not only second language teachers but also content teachers make use of the resulting material is emphasized. Some other positive aspects are included in the final remarks, as is the case of students who considered activities as authentic and the additional �flexibility and user-friendliness� experienced by them. Mª Camino Bueno Alastuey presents a real case of study and focuses on the context of English for Agriculture. After paying attention to some of the benefits and excellences of introducing technology into English learning contexts, particularly into the EFL environment, she remarks that its integration into the curriculum has usually been arduous. She also presents the general ideas which define a context characterized by students who need to face an individualised learning process in order to cater for specific needs (p. 128). The aim of her study would be to explore �the possibilities of WebCT and the effect different organization, layouts and tools have in students and teachers� (p. 129). Firstly, the author sets the general WebCT and language learning bases to go on with an overview of a real language course focused on the context of English for Agriculture (connected with the areas of English for Specific Purposes and Content and Language Integrated Learning). A report about the way in which the course started and the changes introduced during recent years is also included. 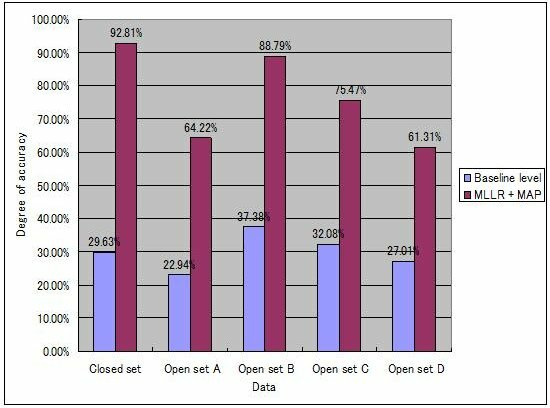 The article concludes by presenting both teachers' and students' perceptions, showing the strong and weak points in each case, which is really useful for the reader to have a global overview of the process presented. The conclusions are seen as an attempt to respond to several questions which are formulated as the main challenges of combining WebCT with language learning and the consideration of the contribution that they could make by �promoting motivation, increasing the exposure to both authentic oral and written texts, tasks and exchange and providing meaningful language use� (p. 149). The main and detailed recommendation would be fostering changes in a progressive and continuous way. Antonella Elia focuses on the role of a collaborative Wiki Weblish Dictionary Project as an attempt to help academic writing of ICT language learners. Her work is devoted to presenting �a world of collaborative opportunities� offered by the Internet (p. 153). The author offers a rapid overview of some of the developments and innovations belonging to the Web 2.0, such as of blogs, wikis, etc. which are usually seen as motivating tools when dealing with language learning. Antonella highlights wikis as the most representative case among collaborative devices in an attempt to offer a clarifying definition and some real examples of what they are and how they work. The main issue is the role of wikis as communities of practice, which would provide �excellent collaborative environments� specially when considering that �learning is a fundamentally social phenomenon� which demands practice, participation, reification, negotiation, etc. The author emphasizes the advantages of trusting students not only as receivers of information, but also as participants in a context which offers them answers and questions, a context which would enable students' exchange of ideas, group interaction, shared knowledge, etc. Weblish is presented as a new variety of ICT language and �one of the most creative domains of contemporary English". Some of its linguistic features are also highlighted by following a very clear, complete and consistent distribution of content. Antonella Elia also tries to verify whether Weblish is a danger for academic writing by presenting a study which shows that �younger generations are undoubtedly familiar and comfortable with the use of Weblish� (p. 167) but which also alerts about different points of view when referring to the degrading or enriching role of Weblish when combined with English language learning. After the theoretical introduction, the issues, bases and results concerning the experimental Wiki Weblish Dictionary are presented. Conclusions show that �students have demonstrated new metalinguistic awareness and expertise� when they are asked to distinguish the appropriate register to use according to the chatting or formal composition demands. Philippa Mungra devotes her contribution to analysing the online delivery of a writing course, in this case, a blended language course integrated into medical studies. Decisions concerning implementation were made as an attempt to comply with the pedagogical aims, taking into account that receivers of the course would be students belonging to the final years of English at Rome University Medical School. Time is seen as a central issue when considering the importance of developing courses such as these, specially when addressed to medical students who are not always able to attend face-to-face lessons due to the large number of clinical hours. According to the author, these facts had an important effect on implementation issues, i.e.�student autonomy, integration with subject teaching and time-flexibility for students� (p. 181). Philippa Mungra addresses the fact that �effective pedagogy requires learning in the most stimulating environment� (p. 182). This is a significant idea when referring to delivering an online language (writing) course. The article offers a presentation of the structure and distribution of contents in modules for four different academic years. The description of the writing course includes different academic genres, hightlighting the fact that the main intention is to foster �skills in communication in a future professional setting� (p. 188). The author presents a final discussion and assessment about this teaching experience by taking into consideration the tools which were used, the types of tasks included and the degree of efficiency of the employed model. In spite of mentioning many advantages such as timetable freedom and additional motivation for students to improve their reading and writing skills, Philippa Mungra also alerts about some important areas of concern such us possible plagiarism and the copy-paste feature. Jaroslaw Krajka closes the compilation by writing about promoting discovery learning in English for academic and professional purposes (EAP/ESP). The author considers that �the lack of properly developed materials provided by publishers make some English teachers find and adapt appropriate teaching resources� (p. 209). Corpora and concordances are seen as the scaffolding for this particular approach to curriculum development. The impact and popularization of internet has also helped to proliferate corpora resources while making them more flexible to the requirements of different teaching contexts. Jaroslaw Krajka presents the project as an attempt to promote this kind of innovative learning by �involving students to a much greater extent� in some of the important phases of the learning process (p. 212). The concordancing procedures are presented as a significant teaching aid in many aspects. The author does not forget about the psychological, logistical (technical) and administrative considerations when developing innovative learning approaches and methodologies. Jaroslaw Krajka addresses the need for also preparing teachers as learners of new utilities and functionalities, which would make the whole process feasible with their future students. The article also presents some screenshots which allow the reader to see what the interface is like and how information and contents are distributed. A training proposal to introduce ESP students to online concordancing-based learning is one of the last and most clarifying sections in this article, as it does not only include an explanation of the general concepts but also real experiences of ICT training for ESP students, as well as a structured list showing the stages for in-class and also self-study work. A brief conclusion section alerts about the need to find applications of technology that would allow a successful integration of the components which take part in the learning process. The nine contributions compiled in this volume can be seen as an elucidating mixture of challenging cases and innovative solutions which are very different if compared with each other but which share an sole aim; that of improving and making more efficient the language learning process. Finding such a complete and interesting repertoire presenting multiple research scenarios sheds light on a field which is followed by an important research community and helps to encourage them to continue working and searching for solutions which can respond to some of the challenges proposed. Contributors show divergent research methodologies and interests of study, but share the will of taking advantage of recent technological developments to improve education. They also share a non-conformist point of view which leads them to create new materials, to adapt tools and developments to their real needs, always bearing in mind the figure of the learner, the one who would notice the final benefit and improvement in education, usually achieved through compilations of research studies like Teaching Academic and Professional English Online. The year 2009 was quite a busy year for the Special Interest Groups (SIGs) in EUROCALL. In March, the Computer-Mediated-Communication (CMC) SIG held a regional workshop in León Spain on issues in researching online interaction (see the report in the last issue of The EUROCALL Review). Furthermore, two new SIGs were set up to focus on the areas of Teacher Education and Virtual Worlds � two themes which have been receiving a good deal of attention from Eurocall members in recent years. We also took some steps this year to make the SIGs more accessible and to encourage more Eurocall members to get involved in their work. Firstly, the SIG meetings in EUROCALL 2009 were staggered, meaning that they took place at different times during the conference. This enabled people to attend more than one meeting if they wished. Secondly, three of the SIGs (Teacher Education, Virtual Worlds and CMC) took up NING platforms as their virtual homes instead of using traditional webpages. This has been done in the hope of making the SIGs more interactive and participative, as well as reflecting the Web 2.0 times we are living in. The Natural Language Processing (NLP) SIG is currently discussing a restructuring of their online presence and the CorpusCALL SIG will be holding elections for a new chair and secretary at EUROCALL 2010. We hope to get more EUROCALL members involved in the activities of the SIGs which reflect their areas of research and teaching. So, if members wish to find out more, please go to the EUROCALL SIG website and read up more on want the SIGs are doing and who you can contact in order to get involved. The following are some brief reports of the SIG meetings held at EUROCALL 2009 in Gandía. Chaired by Alex Boulton as neither the Chair (Ylva Berglund-Prytz) nor Secretary (Sabine Braun) were able to attend (though thanks to them and others for contributing information), hence a slightly impromptu agenda, along with apologies for any infelicities in this very brief summary. Discussion list (https://www.jiscmail.ac.uk/cgi-bin/webadmin?A0=corpuscall): other discussion lists for corpora and FLT are also underused, e.g. LinguistList / CLLT (hosted by Mike Barlow at https://mailman.rice.edu/mailman/listinfo/cllt). As a �critical mass� is needed for such lists and forums to work, perhaps there could be scope for collaboration? We don't seem to have the necessary �community� feel at the moment. SIG website (currently hosted by Ylva Berglund at http://www.corpuscall.org.uk): a SIG website could be used as a repository for information frequently scattered around the web on individual sites � member contact info, current projects, activities, links to resources and publications, bibliographies, etc. Future activities: (i) there was some talk of a mid-year event, though no specific proposals have (as yet) been received; (ii) there is a proposal for a CorpusCALL workshop at next year's EUROCALL meeting, coordinated by Maud Ciekanski and Marie-Laure Betbeder: �Dissemination and comparison of research findings: developing contextualised learning and teaching corpora (LETEC)�; (iii) suggestions also for another, more general event (either a second pre-conference workshop, or to avoid competition perhaps a symposium during the conference), and for pushing harder for a more comprehensive and coherent corpus strand during the conference. A key issue is clearly time for individuals to invest if the SIG is to become more active. The Chair and Secretary have decided to stand down after several years of activity, so elections will need to be held in the coming year; the SIG constitution will soon be drafted, and we will be seeking candidates for these posts � and, if possible, someone to look into the possibilities of hosting and maintaining a website, the discussion list, etc. The CMC SIG was held Thursday, 10 September 2009. and was co-chaired by Sarah Guth and Francesca Helm. The main points dealt with during the meeting included the feasibility of carrying out a summer school for postgraduate students working on CMC at one of the participating institutions. There was a discussion about how this could be organised. Suggestions included : Invited speakers give introductory theoretical lectures followed by case studies. Students could bring data for data sessions as follow-up. A session on how to publish was also suggested. Ideas for funding which were discussed included combining Comenius teacher training (minimum five days); looking for EU funds through joint degrees. It was pointed out that possible weaknesses for these suggestions lie in the limited parameters (Comenius is for teachers, not researchers) and the timeframe of EU projects. After a period of silence and inactivity of the EUROCALL Teacher Education SIG, members of the Executive Committee decided to use the EUROCALL conference in Gandia as an opportunity to make a fresh start. A meeting was scheduled on the 3rd day of the conference and 37 colleagues attended. The attendees discussed their expectations, elected a chair (Mirjam Hauck, The Open University/UK) and a secretary (Nicolas Guichon, Lyon 2/France), and made preliminary plans for a regional meeting in Spring 2010. In January 2010 a call for submissions to a European research workshop on Teacher Education in CALL went out. The regional workshop is scheduled to take place from 26-28 May 2010 at the Institut National de Recherche Pédagogique (INRS) in Lyon/France and limited to 40 attendees (including the three keynote speakers � Rick Kern, Jena-Claude Bertin and Garry Motteram � and the organisers). We would like to thank our colleague Christine Develotte who is based at the INRS for her support in organising the workshop. A call for expression of interest in contributing to a symposium organised by the SIG at the next EUROCALL conference in Bordeaux received positive feedback from a number of SIG members. A symposium proposal will be submitted to the scientific committee by the official submission deadline (15 February 2010). It has been clear for some time that there is a growing interest in using virtual worlds for language learning and teaching, especially the virtual world of Second Life (SL). There have been several presentations on virtual worlds at recent EUROCALL and CALICO conferences, and introductory workshops for newcomers to Second Life have also taken place at the conferences of both our associations. The first of a series of three online SLanguages conferences, organised by The Consultants-E, took place in Second Life in 2007, followed by two more conferences in 2008 and 2009. Following discussions between Graham Davies (EUROCALL), Thom Thibeault (CALICO) and Randall Sadler (CALICO) in early 2009, it was decided to approach EUROCALL members to see if they would support the establishment of a Joint EUROCALL/CALICO Virtual Worlds SIG (VW SIG) . CALICO had already set up its own VW SIG, but it was felt that both our associations would benefit from closer collaboration in this area � and, of course, using Second Life for communication and meetings makes such collaboration a lot easier. On 11 September a meeting attended by 20 participants took place at the EUROCALL 2009 conference and it was agreed that a Joint EUROCALL/CALICO VW SIG should be established, managed by Graham Davies (Groovy Winkler in SL) on behalf of EUROCALL and Randall Sadler (Randall Renoir in SL) on behalf of CALICO. The VW SIG has now been formally established and a VW SIG Ning has been set up to facilitate communication, exchange information, announce events and initiate discussions. Anyone may join the Ning, but to take part in future events (e.g. workshops, seminars) organised by the SIG you must be a member of EUROCALL or CALICO. As for the direction that the new VW SIG will take, we are completely open to suggestions. It will be possible, for example, to offer training courses in using virtual worlds, language classes, quests and virtual tours, as well as advising on places to visit in Second Life where students can be exposed to a wide range of different languages. Both EUROCALL and CALICO have a physical presence in Second Life. In November 2007 I began setting up a EUROCALL HQ on one of the group of EduNation Islands, and in early 2009 CALICO moved in immediately next door. The two locations, which are linked by an internal teleport system, form a significant joint presence in Second Life for teachers and learners of foreign languages. If you already have the Second Life software installed on your computer you can visit us by clicking here: Welcome Pavilion. I have spent many hours setting up the EUROCALL HQ. The building was ready-made, and all it had to do was furnish it. Initially I went overboard with the furniture. My furniture was too elaborate and the prim count soared sky-high, so I got rid of a lot of fancy furniture and replaced it with simple tables and bean bags. Randall Sadler has helped me make additional improvements, such as the installation of seating facilities in the meeting rooms, where the number of chairs automatically increases as more participants join a meeting. There are also projection screens on which still images, PowerPoint slides and video clips can be displayed. The building has a house cat sitting by the fire � she will miaow if you stroke her � and I bought a pet greyhound, who can be seen eating his dinner on the front porch or lying on his bed in the corner of the lounge. When I enter the house he follows me around. There is also a Coca Cola machine, which will hand you, free of charge, a can of Coke. The environment is both practical and homely, and you can pick up notecards telling you more about EUROCALL and CALICO, including forthcoming events. In the lounge you will find a box containing a list of landmarks of locations in Second Life that are of interest to language learners and teachers. I make regular use of the facilities, meeting Randall Sadler there at least once a week, showing people around and giving presentations at conferences, both face-to-face and online. CALICO does not have a permanent building on its land, which is immediately next door to the EUROCALL HQ. Randall Sadler decided that he would prefer to have a choice of different facilities available to suit different situations, so he has set up a holodeck system. What's a holodeck? The term derives from the Star Trek series, in which a holodeck is depicted as an enclosed room where realistic simulations can be created both for training and for entertainment. Holodecks in Second Life fulfill more or less the same functions. Think of them as mini-simulations within the Second Life virtual world simulation as a whole. A holodeck offers exciting possibilities of calling up a range of instantly available simulations that can be used for entertainment, presentations, conferencing and, of course, teaching and learning. A holodeck simulation is generated by means of a rezzer that takes the form of a flat blue ring that can generate different scenes in seconds. Instructions on using the rezzer are available in our Welcome Pavilion. Both CALICO and EUROCALL use the Horizons system, which is commercially available in Second Life at a modest cost. There is a second holodeck rezzer on the roof of the EUROCALL HQ, and a third one is located on the Skydeck, which is 2000 metres high in the sky and accessible via the internal teleport system . Another location that can be accessed via the internal teleport system is the Resources Centre, 1000 metres high in the sky. This contains a growing collection of free resources, for example clothes for newbies, landmarks of interesting locations in Second Life, PowerPoint presenters, buildings, furniture, plants etc. To access the Skydeck or the Resources Centre just left-click on any teleporter (a small circular pad on the ground), choose Skydeck or Resources and then left-click on the beam that appears. Around 100 unique visitors per month visit the EUROCALL/CALICO complex. EUROCALL and CALICO are in good company on the EduNation Islands. Thierry Chanier (Thierry Claremont in SL) has established the ALSIC HQ opposite the EUROCALL/CALICO complex, and Françoise Blin (Francie Bialyk in SL), Vice-President of EUROCALL, maintains the Dublin City University iMUVE HQ, which is just a short walk away. There is also a centre in Second Life for language teachers in primary and secondary education maintained jointly by the ALL London and MFL Resources Group on EduNation I Island. A number of EC-funded projects investigating the possibilities of teaching and learning languages in Second life have recently been initiated, for example the AVALON and NIFLAR projects. The British Council has its own British Council Isle and there is a secure Second Life for Teens area for learners of English as a Foreign Language aged 13-17. If you are new to Second Life there is a wealth of information in the rapidly expanding Section 14.2.1 of Module 1.5 at the ICT4LT Website. There are also step-by-step tutorial materials in Word format for newcomers, written by Graham Davies, that can be downloaded from here: Introduction to Second Life. There is a useful JISC document titled Getting started in Second Life. The first part of the document covering the basics, and the second part focuses on the more advanced skills of building and scripting, designing courses in Second Life, as well as offering useful practical advice on setting up Second Life in an educational institution. An excellent set of tutorials on Second Life, in the form of captured screen videos with voice over, are available at Russell Stannard's Teacher Training Videos website. So what does Second Life offer the language learner? Virtual classrooms: There are many virtual classrooms in Second Life where it is possible to learn a new language or brush up your knowledge of a language that you already know. Languagelab is one of many commercial companies in Second Life, and the Goethe-Institut, for example, offers regular free classes in German. Simulations of real countries and cities: There are many simulations in Second Life that reflect the physical appearance and culture of real countries and cities. Learners exploring these simulations can meet individuals and engage with them in voice chat or text chat in a variety of languages. Many signs and instructions are posted in the "local" language, and automatic tours by train, tram or even Roman chariot may be offered with commentaries in different languages. Quests: Second Life quests, which are similar in many respects to Web quests, are already well established. For example, the teacher may ask learners to search for an object that reflects the culture of a specific country, take a snapshot of it and write an accompanying textual description either in their own language or in the language that they are studying. Task-based learning: It is relatively easy to set up tasks in Second Life that simulate real-life tasks. I once observed a session in which a class of language learners was divided into groups and had to set a dinner table for each of their groups by picking up items of food from a large table and transferring them to their smaller tables. They were learning the names of the items of food, understanding instructions and using verbs and prepositions of location and placement. They were also using a great deal of language in the process of collaborating with one another. Once considered just an online game, Second Life is now a phenomenon that language teachers have to take seriously.